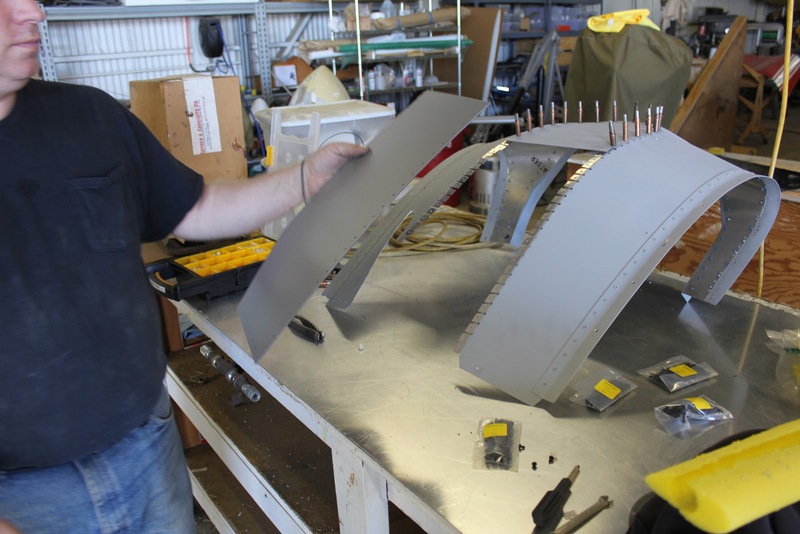 This is a one-off prototype wing to fuselage fairing that were making. 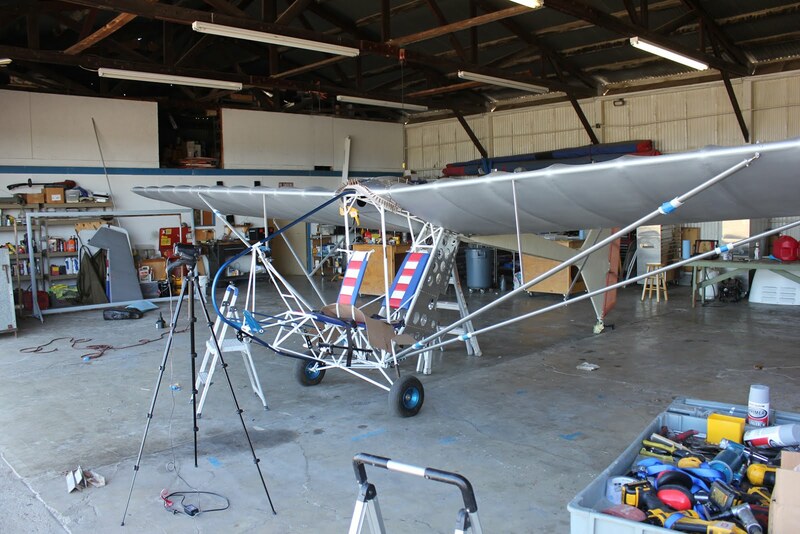 We will update this once we get to the production aircraft. This will be the premise for the design for the production fairing that utilizes the BRS ballistic parachute system. Before we begin the prototyping process for this fairing it’s important that you have a visual picture in your head of what it’s going to look like. 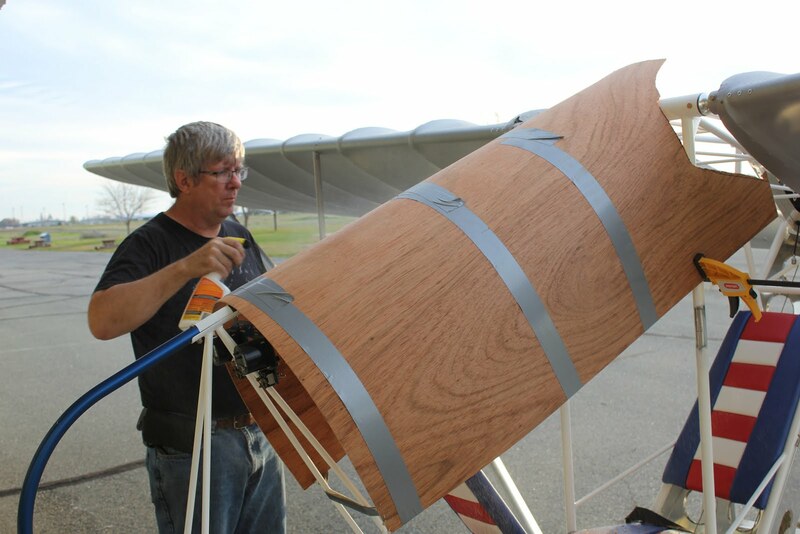 With that in mind we get started with building the center box that we will use to build the fairing from. Were making this box from 1/4 inch plywood and the skins from 1/8 inch mahogany door skin. Both of these pieces of plywood are relatively cheap $12-$15 for a 4 x 8 sheet. 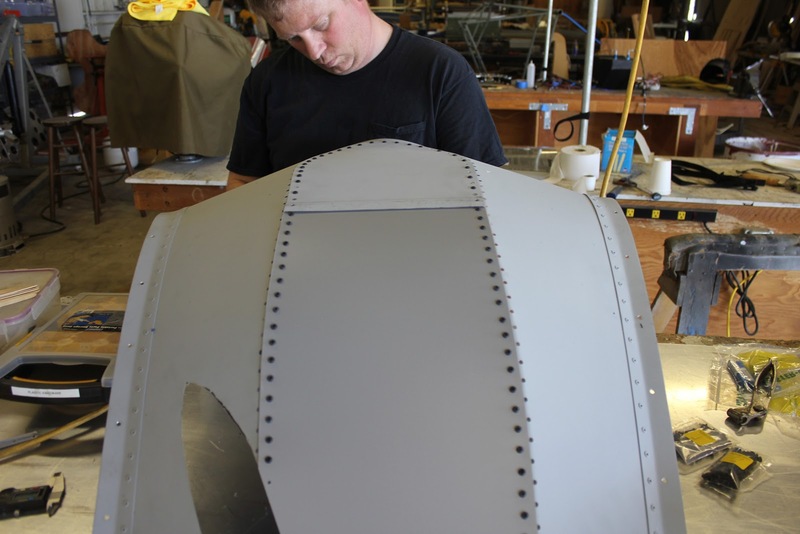 We create bulkheads for the sides of the center box that will carry the profile from the fuselage boom up over the ballistic parachute and transition down to the forward keel. 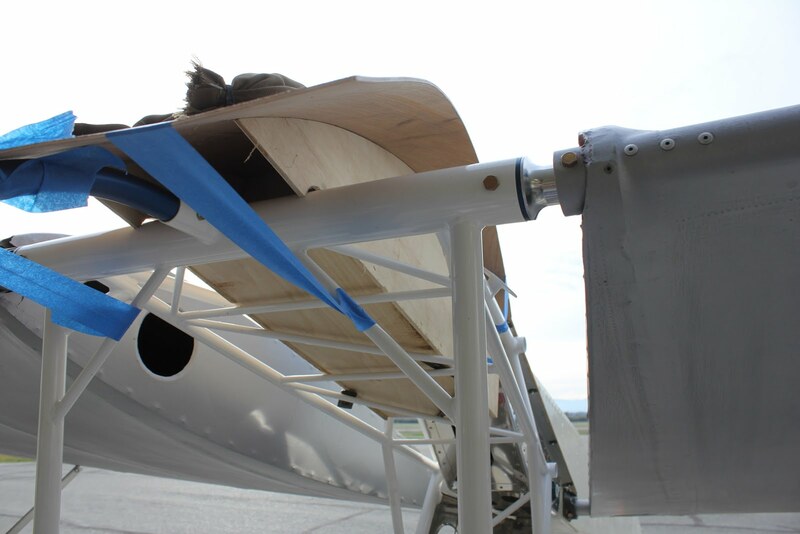 We will need the transition to occur slightly above the keel so that we can use the keel overhead to assist in climbing in and out of the aircraft. 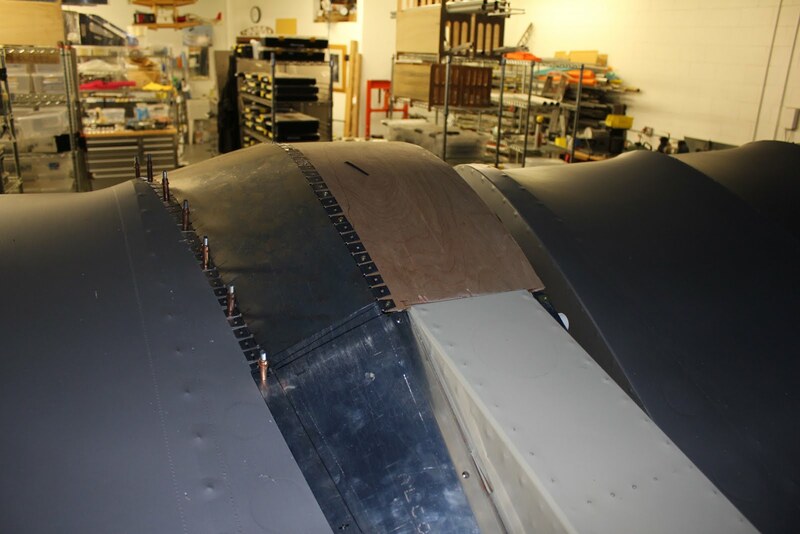 Once we have the two bulkhead formers for the center box created and cut out to fit the profile of the forward spar carry through on the fuselage frame. 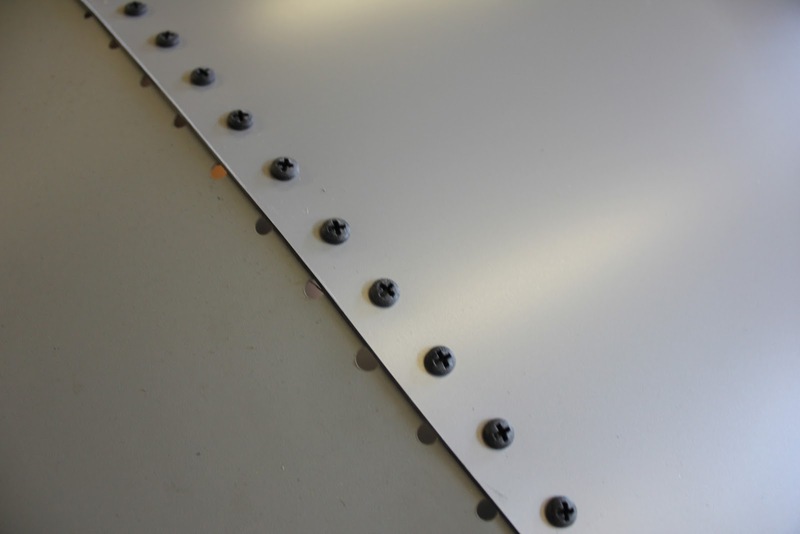 We create a baseboard that we can staple the bulkheads to. and then we can create vertical bulkheads to provide stability and rigidity when we go to skin the top of it with 1/8 inch plywood. 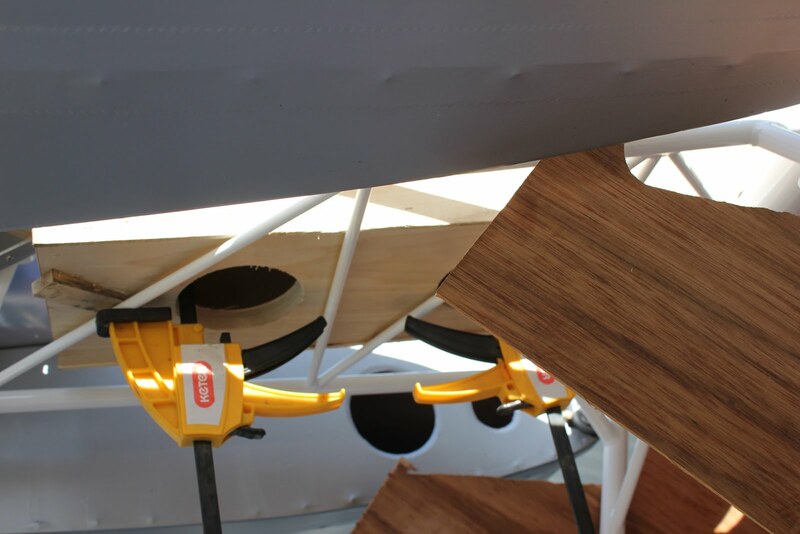 Next, we skin the top of the center box using 1/8 inch plywood and super gluing it to the bulkheads. 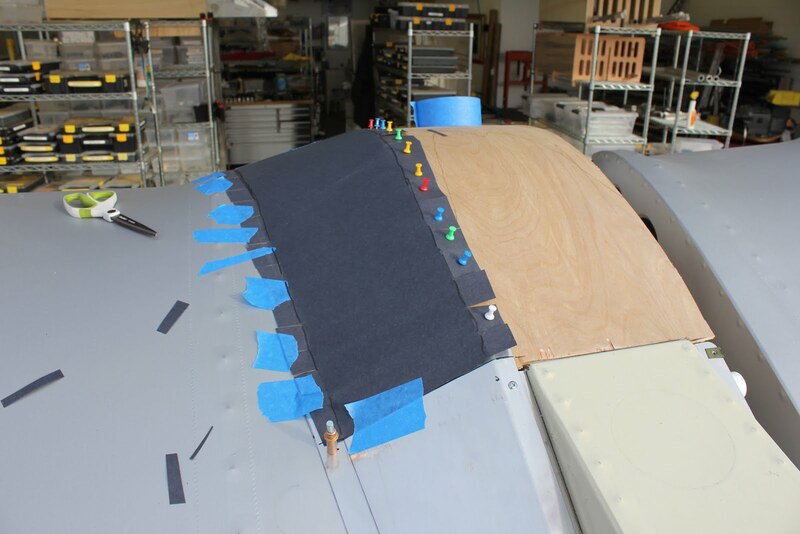 Once the superglue is cured we come back and add a little additional superglue to the edges to provide rigidity before we can remove the box from the fuselage frame. During the curing process we put lead shot bags to help hold it in place. 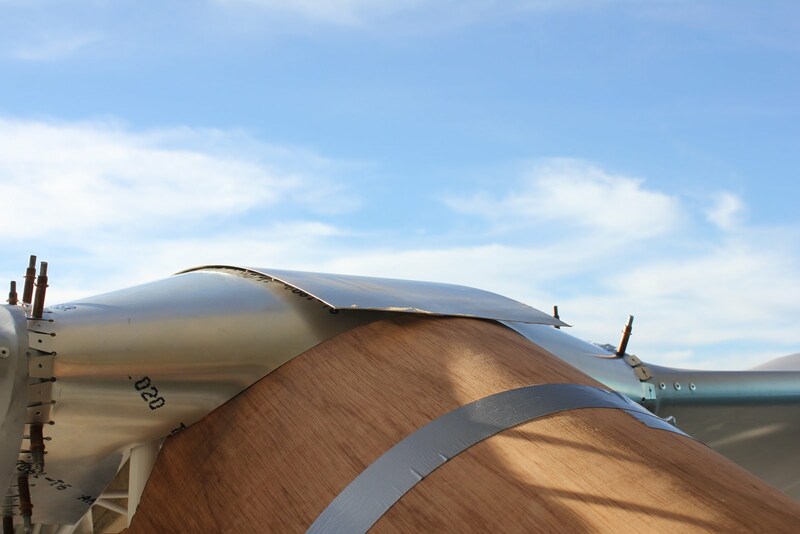 There’s a significant amount of tension on the plywood trying to form this tight of a curve. 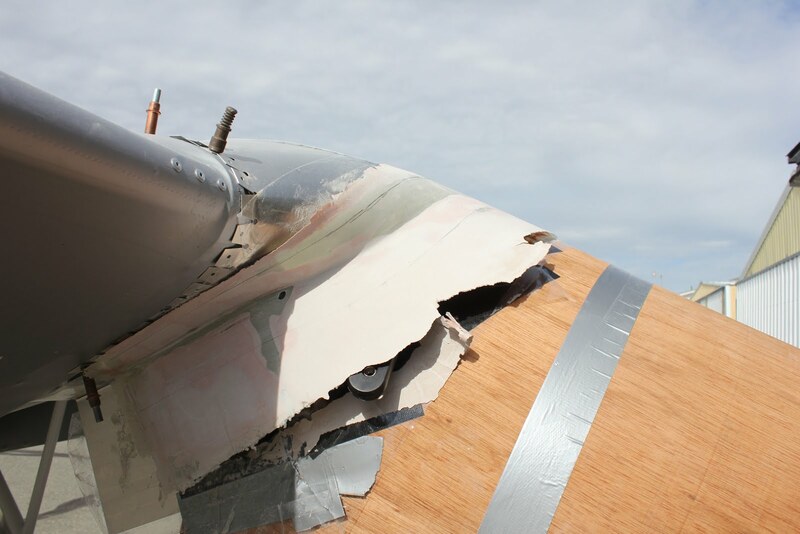 after the center box and top skin has had a chance to cure we remove it from the airplane and bring it into the shop. 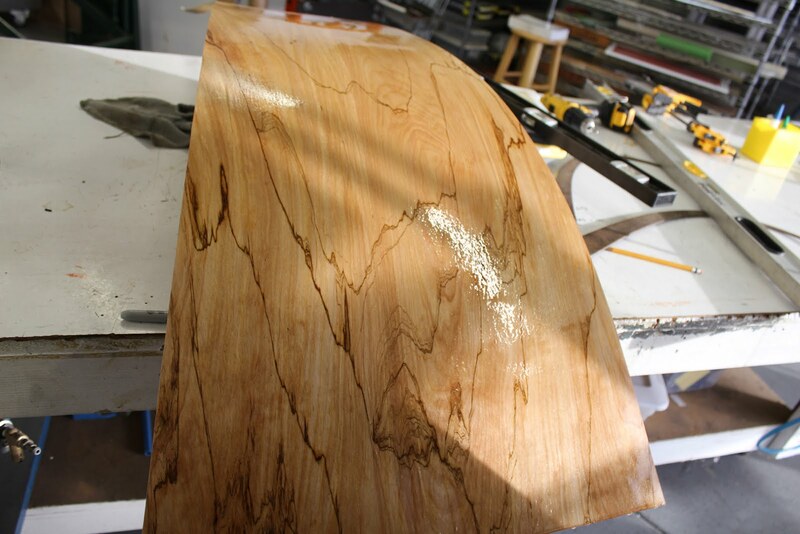 We then start spraying the top side of the plywood with water. 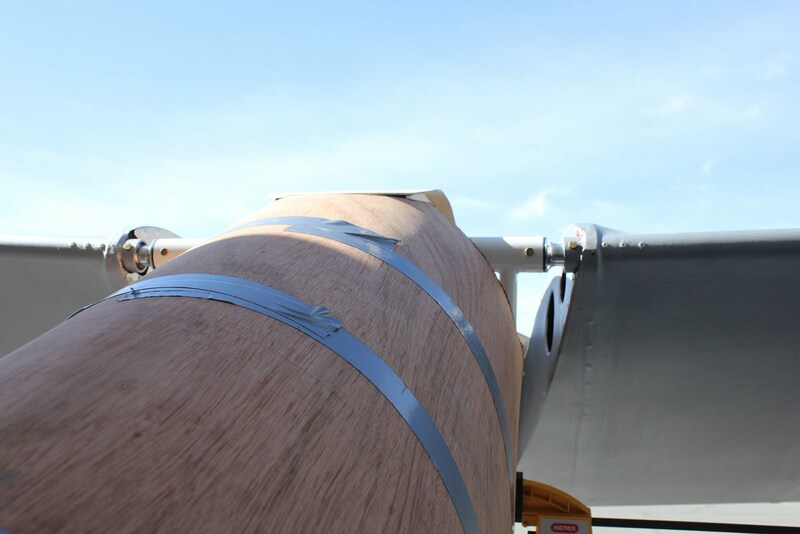 The purpose of the water is to expand the upper surface of the plywood relieving the stresses and allowing the plywood to conform naturally to the curve of the bulkheads that we placed under it. we normally use about four applications of water to relieve the stresses. the next step is we have to make a dummy windshield. We make this out of 1/8 inch plywood door skin material. The door skin material retains a nice even curve distribution which will emulate the Plexiglas or Lexan windshield. 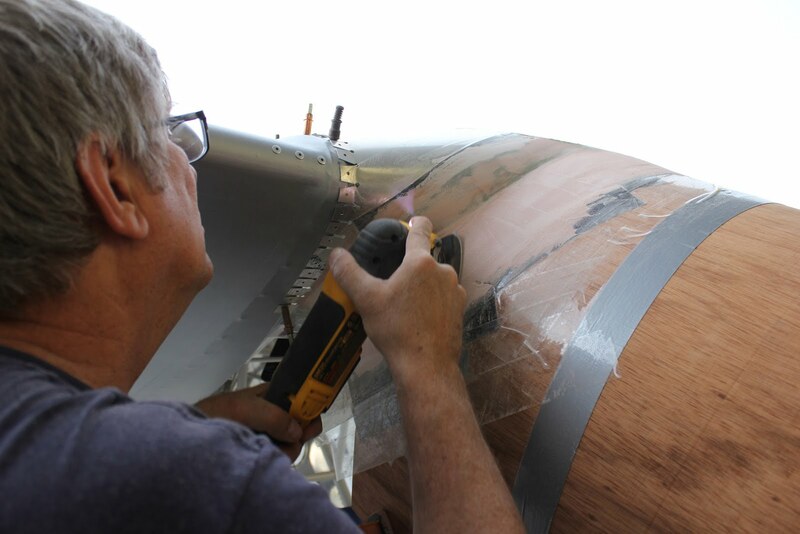 And just like with the skin on the top of the center section we will apply water several times to relieve the stresses while it’s held in place with the clamps on the side of the fuselage and the duct tape that’s wrapped around the perimeter. Once the stresses in the windshield have been relieved we can start to position the windshield as it would be during the final installation. 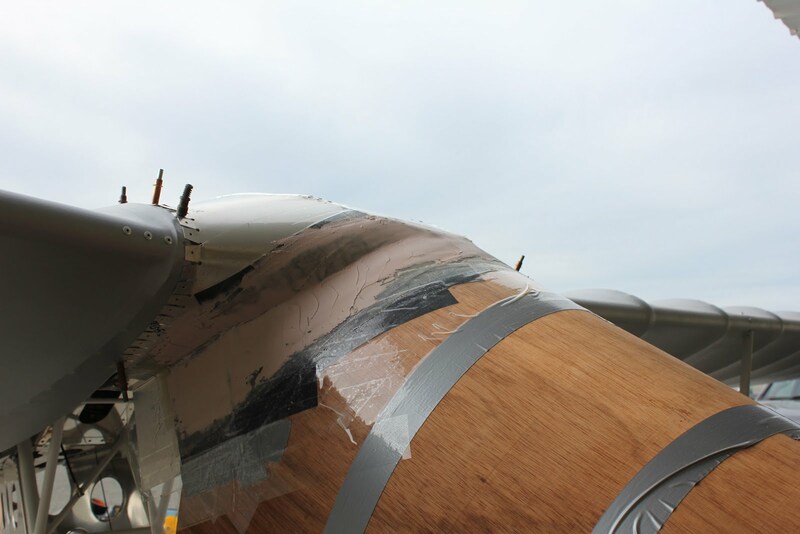 We slowly cut out around the forward spar and forward bulkhead to provide the proper clearance while leaving the proper radius on the windshield itself. Once the stresses have been relieved in the skin that we’ve attached to the center section box we now come back and cut a couple of holes through the bottom of the baseboard. this will allow us to get inside and glue all of the individual bulkheads for additional strength while working with the center section box. Keep in mind the center section box will only be used for the manufacturing process and will be discarded later. 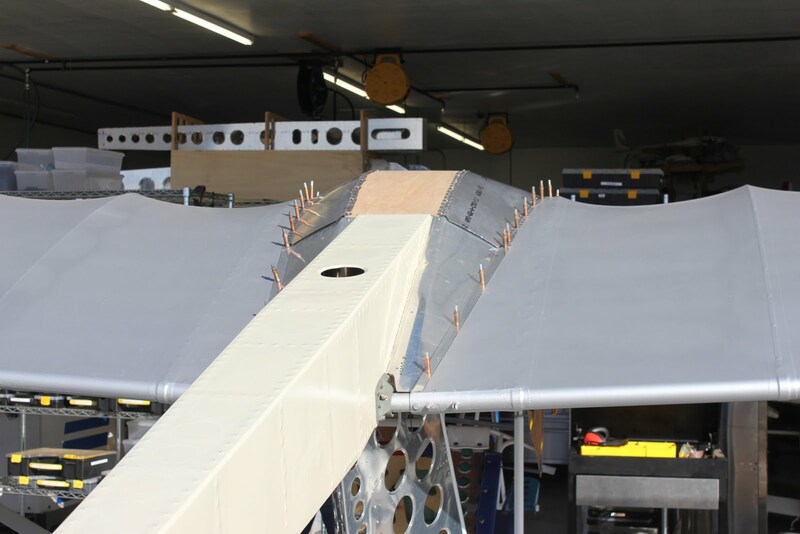 Once we have the center section box in place we can start with the manufacturing of the aft fairings that transition from the fuselage boom over to the wing. 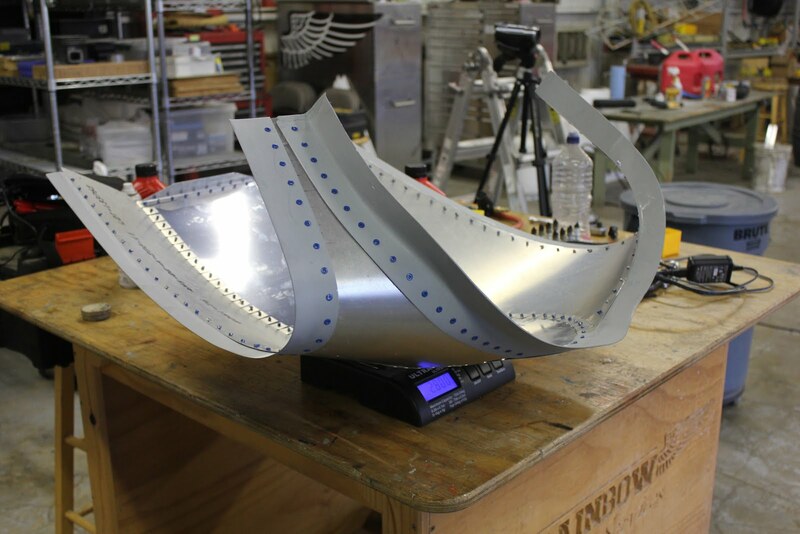 we simply make this from a cardboard template and then transfer it to sheet-metal. In this case we are using .016″ 2024 T-3 aluminum. 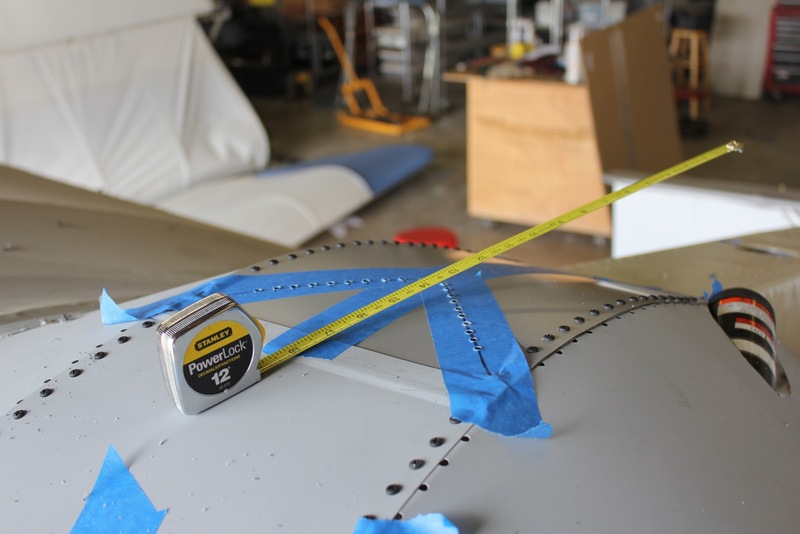 this is about the smallest thickness that you can work with on any aircraft. Optionally .020″ 6061 T6 would be an alternative. 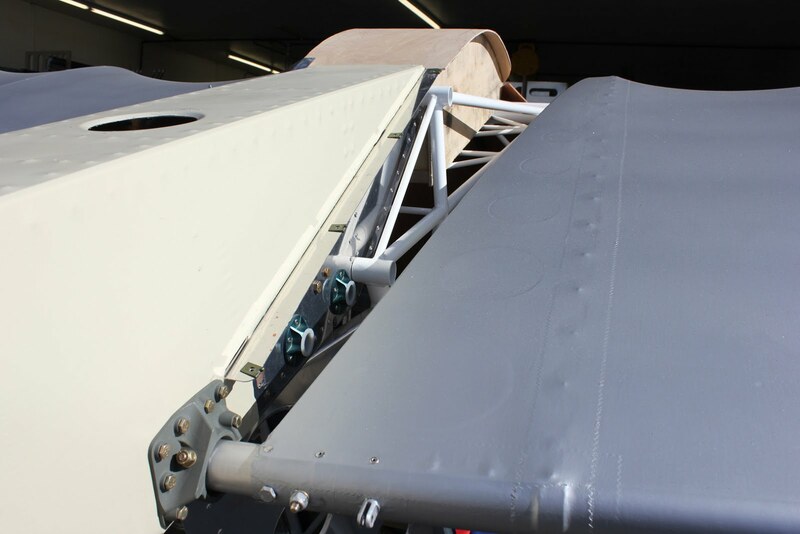 The center section fairings are secured to the fuselage boom assembly with four equally spaced Tinnerman nuts. 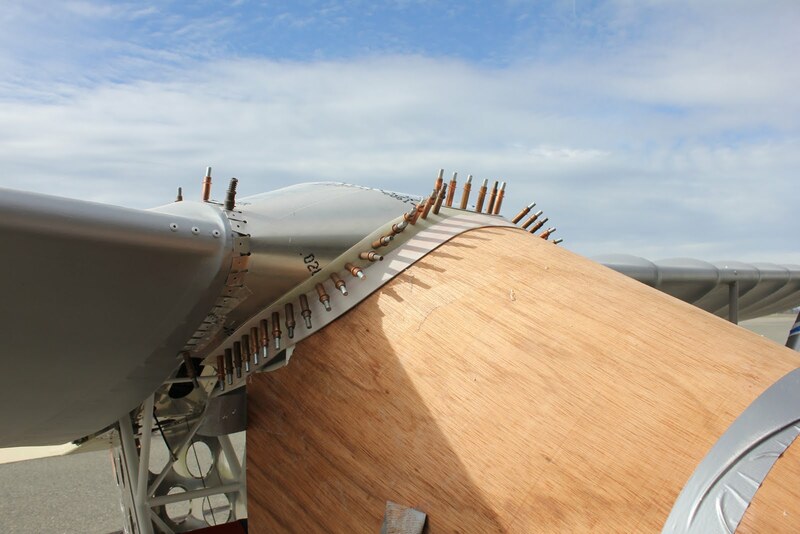 #6 screws and nuts are more than sufficient for these fairings. The next step is to interface the upper center section box profile with the front windscreen. 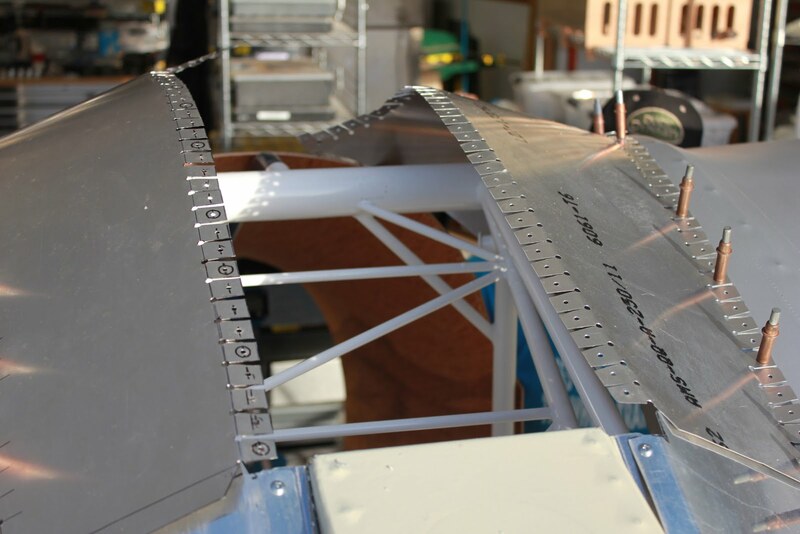 The apex of the center section box needs to correspond with the leading edge of the wing in order to provide a smooth profile transition to the wing. Looking along the windshield profile you can see the smooth intersection with the center box. once we have the windshield and center box properly positioned weekend superglue the two pieces together to hold them temporarily in place while were building the fairings. 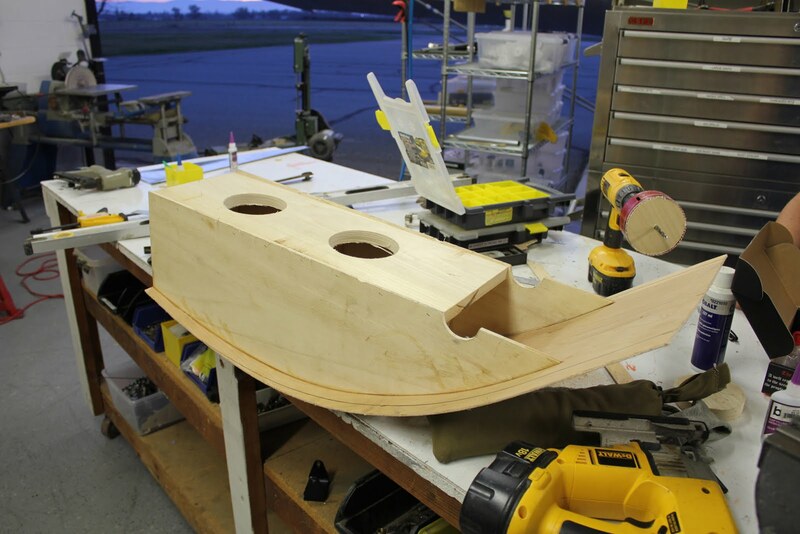 In this picture here we see the center section box with the holes that we drilled in the base being used to clamp the box to the fuselage frame while we work with it. 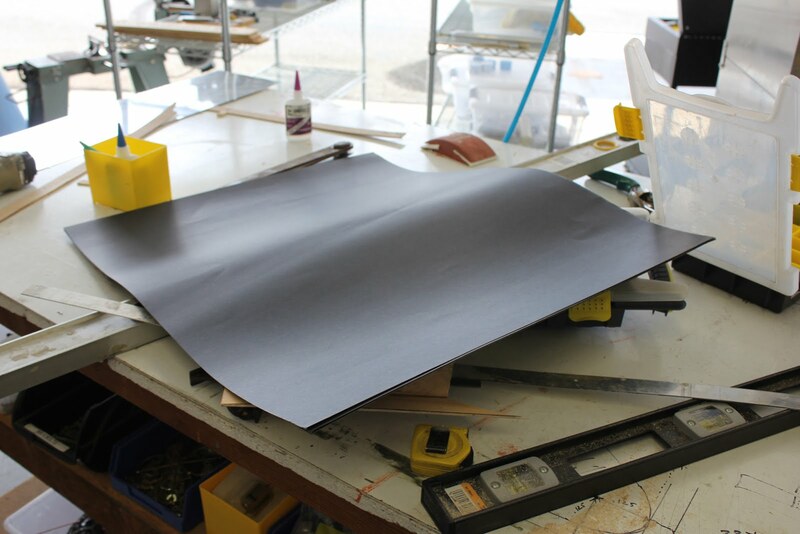 Next we are going to take black construction paper to use it to manufacture the templates that will be used to generate the profile for the sheet-metal wing to center section fairing. 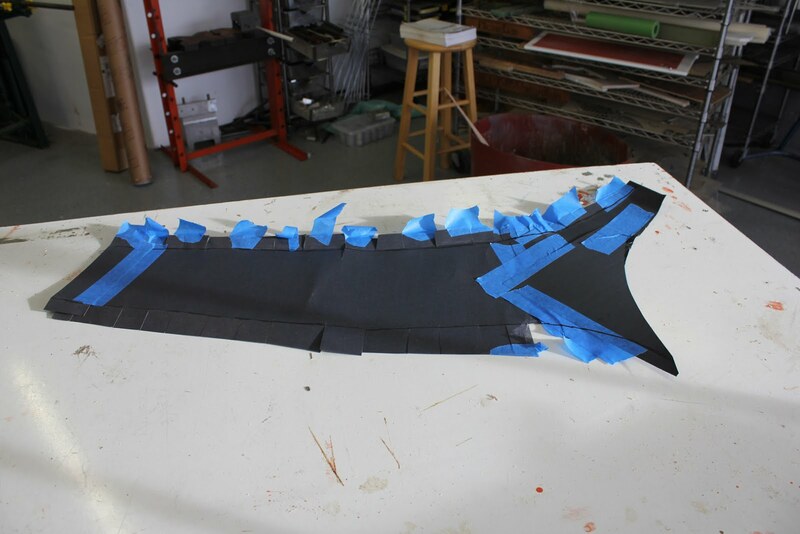 Starting in the back we start to fold and cut pleats out of the construction paper using tape and pins we position it and slowly work our way forward. As we move forward even if the size of the template becomes maladjusted doors and big enough we simply taped together more pieces of paper on a flat plane and then continue to cut trim and Mark as we go. Looking at the top view we can see how the template starts to take the shape of the wing and the upper wing box and then curving back into the center section where it meets with the windshield. If we use the leading edge of the wing and the leading edge of the upper box the template will make a natural transition around to the bottom surface. 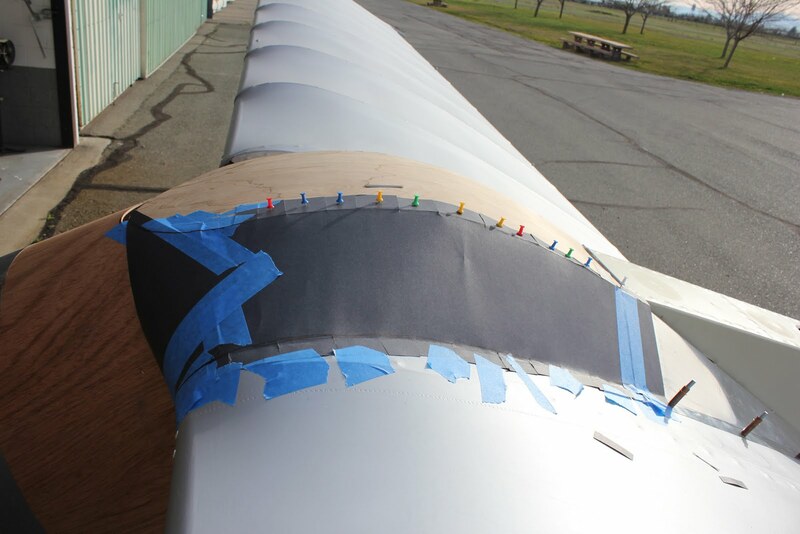 After completing the leading edge we come back to the trailing edge and add a little extra material to extend the template to a more natural position that intersects with the trailing edge fairing. 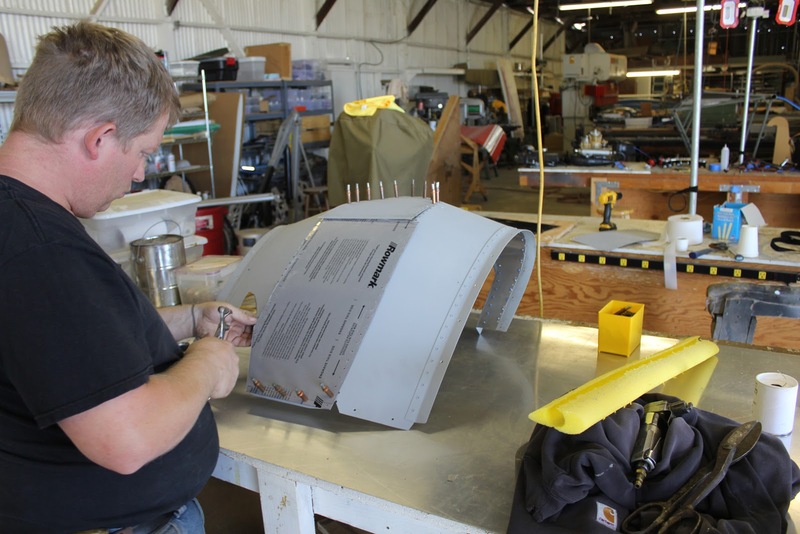 After the template has been marked and fit perfectly to the airframe will will remove it from the aircraft and use it to transfer the design to a piece of aluminum sheet metal. Next we will cut all of the flanged tabs off of the cardboard template so that we can have a smooth transition surface and we will re-add the flanged tabs afterwards. 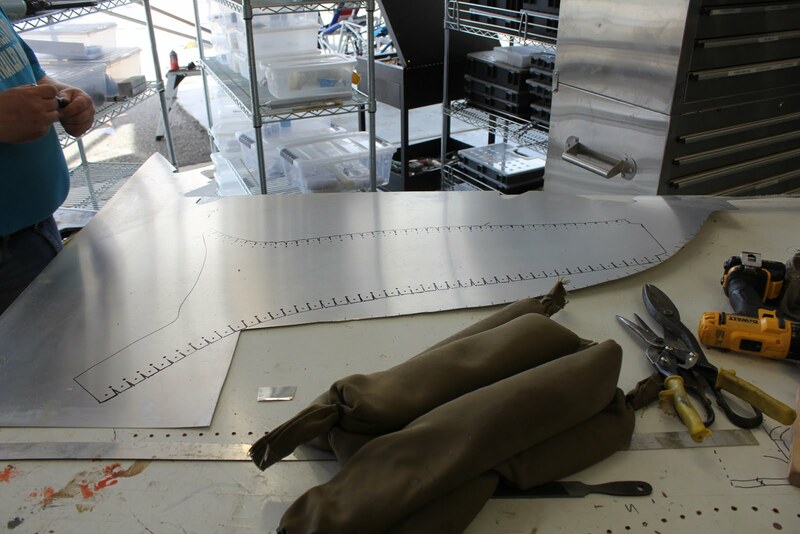 Next we will transfer the template with the flanges cut off onto sheet-metal.. In this case were going to use some 6061 T6 .020″ thick. We initially transfer the profile without the tabs and then afterwards re-add the tabs making them .75×.75. Then we will drill the intersection of each tab with a unit bit to 5/32 inch in diameter. 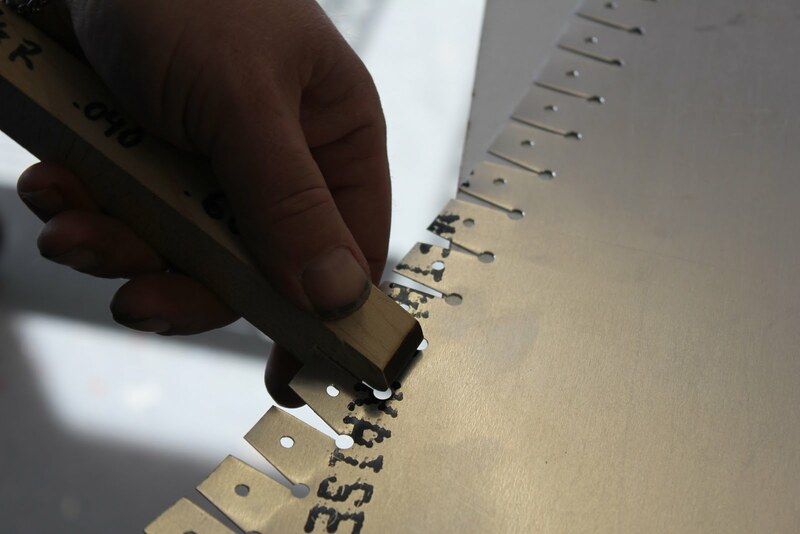 once we have each of the Holes drilled we will use a pair of tin snips to snip the intersection making individual tabs along the edge. 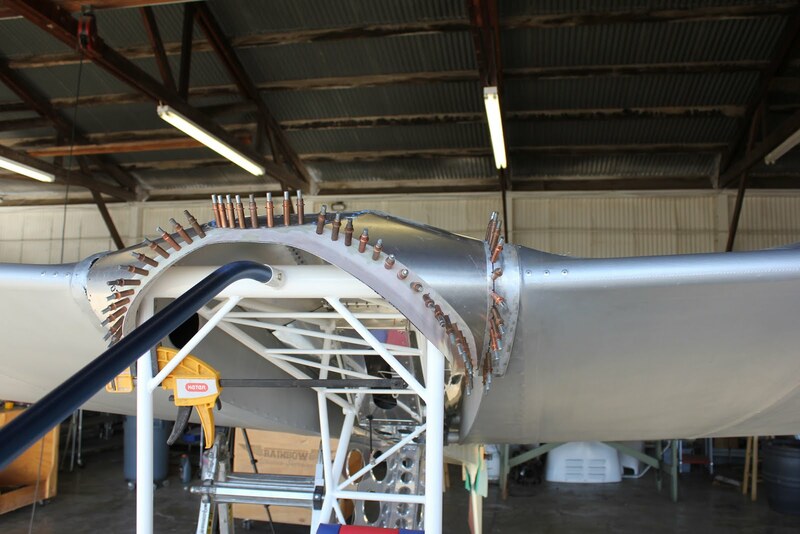 This will allow the tabs to bend into dependently of each other matching up to the fuselage center section as well is the wing. 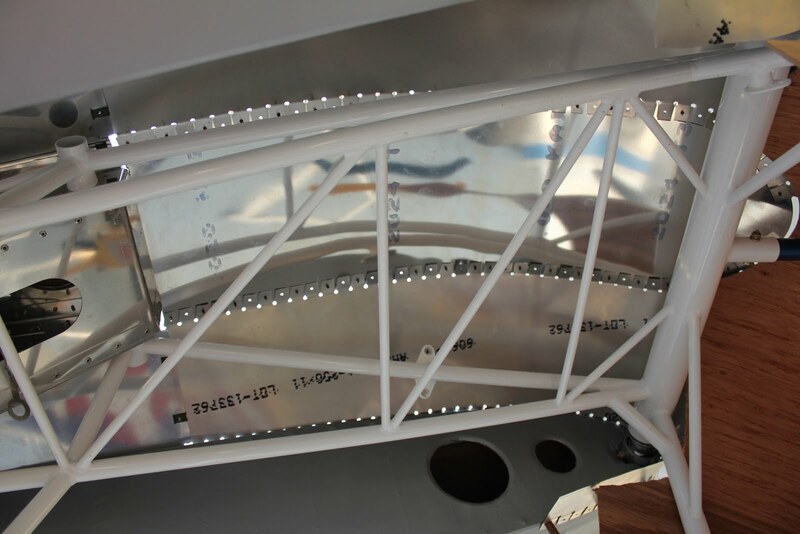 Next we will transfer the metal fairing to the aircraft and using evenly spaced holes in the tabs Cleco it to the wing and then the tabs which are predrilled we will use wood screws to attach to the center box temporarily. 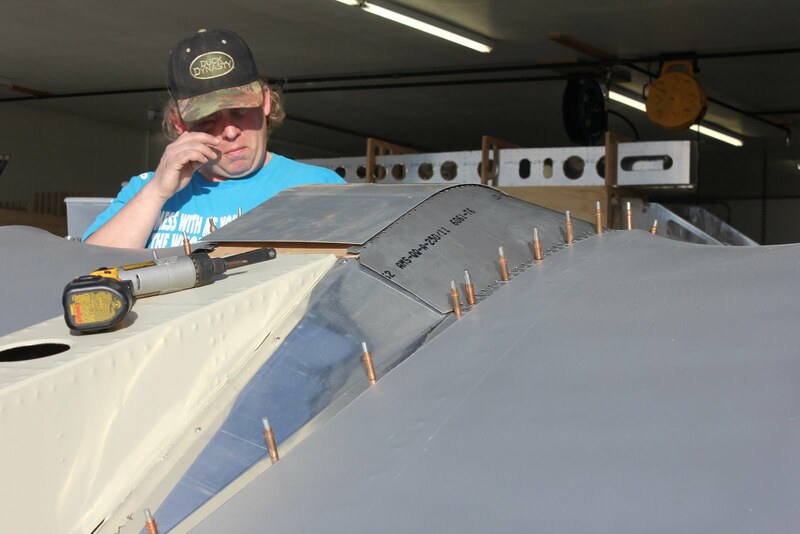 We continue to wrap the fairing around the leading edge while attaching it to the wing and the center section box up to the center where the windshield transitions into the wing box. 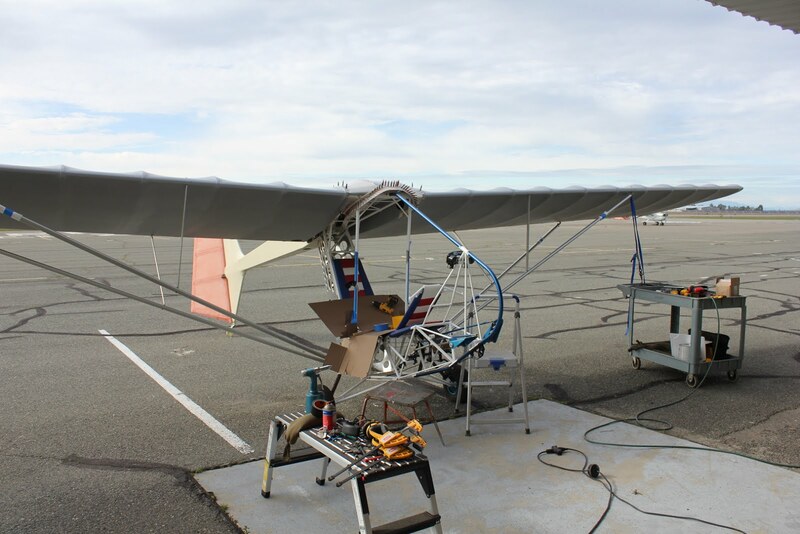 Any additional trimming needed around the fuselage frame and the windshield takes place while we fit the aluminum to the windshield profile. 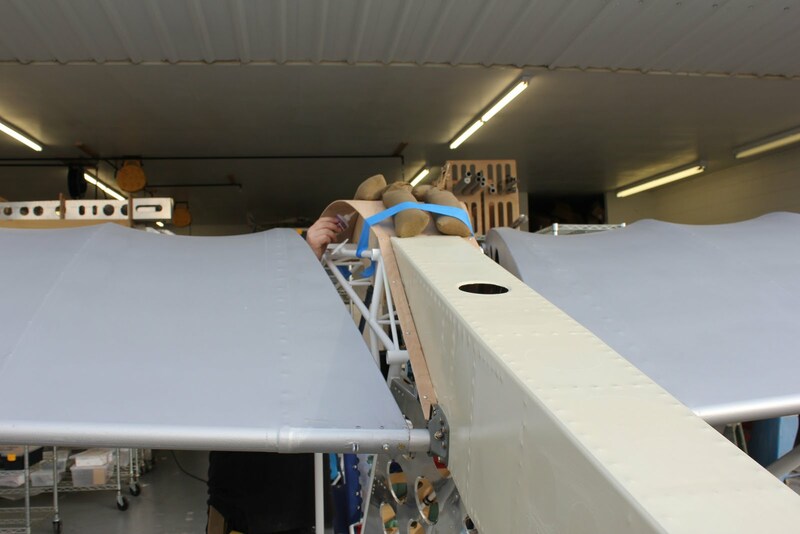 Next step in the process is to take the components from the left side of the fuselage remove them from the aircraft and make templates so that we can reverse the design for the right side. 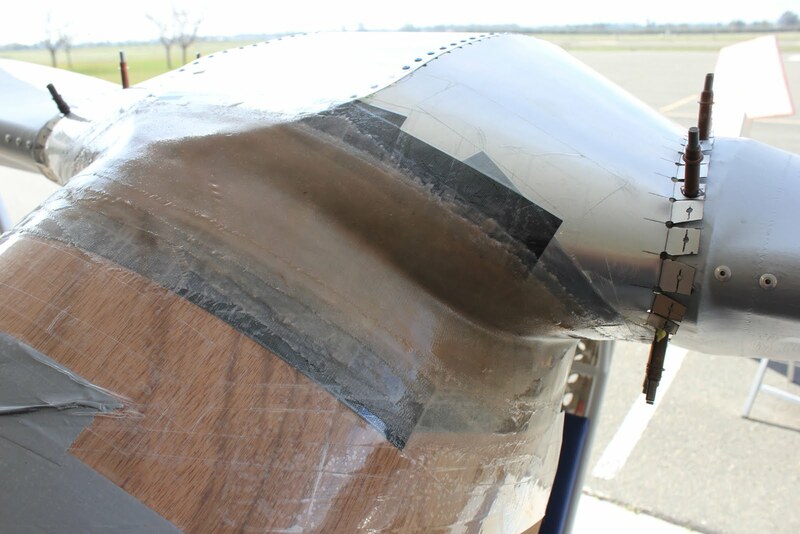 By adding an extra bend into the aft fairing we can make it conform more readily to the curvature of the aft portion of the wing. 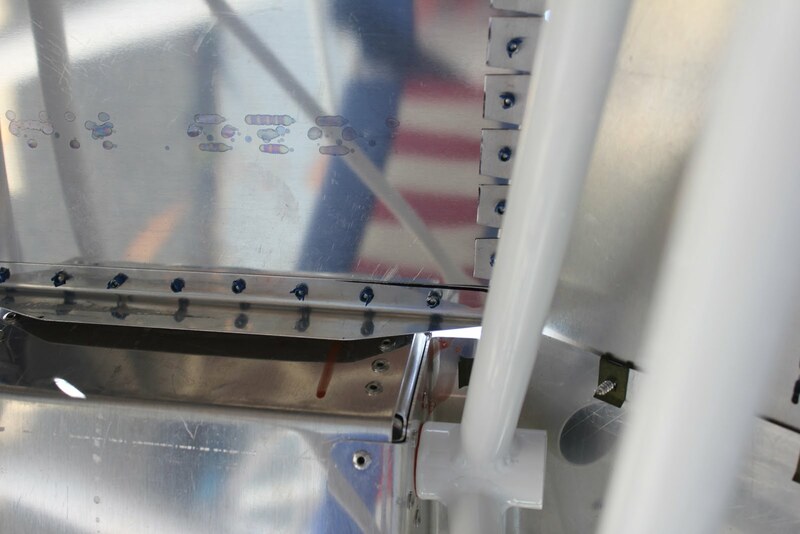 A better picture of the tabs that form the interface from the center section to the fairing. 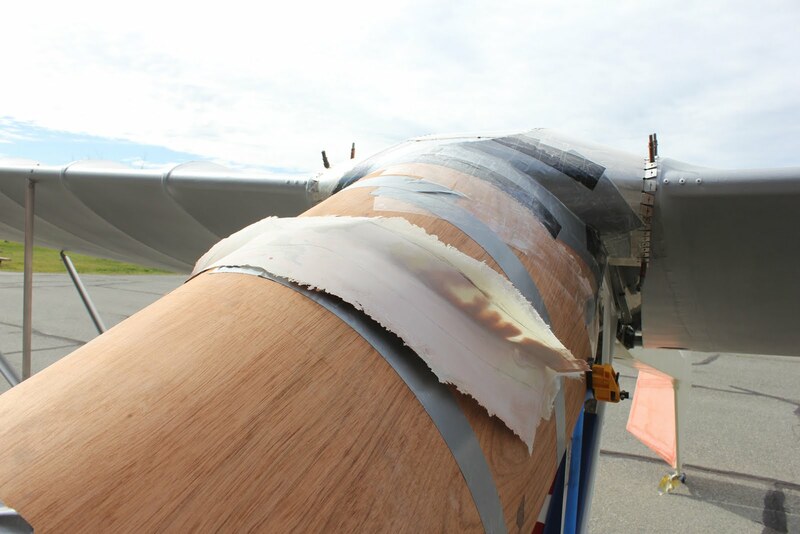 We will now remove the fairing from the fuselage so that we can duplicate it as well as the aft fairing. 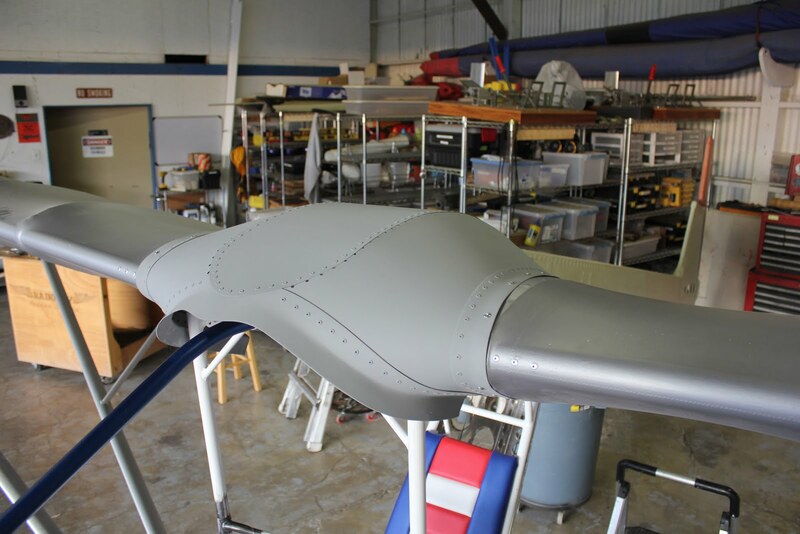 Once we have the left side fairing removed from the aircraft we will transfer it to another piece of .020 6061 T6 aluminum to make the right side fairing. 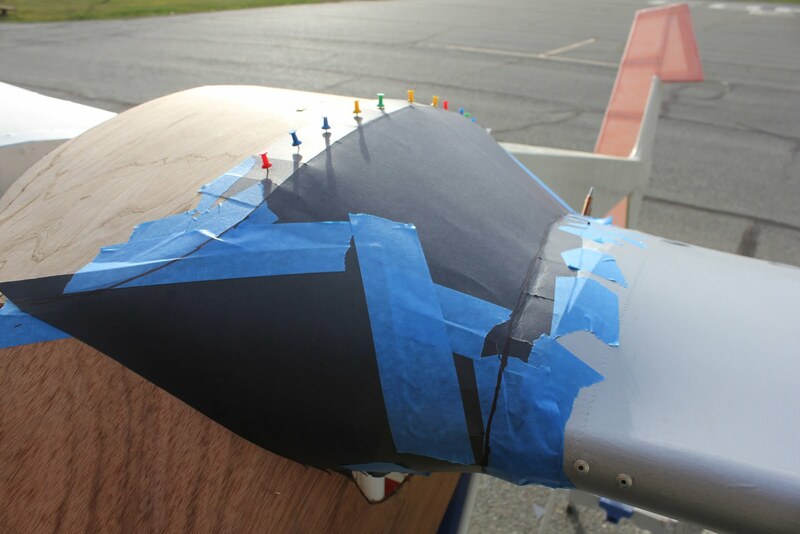 A picture of the left side fairing that we used to create the template for the right side. Each one of the tabs need to be bent individually to match the profile in their particular location. Some of the tabs will be bent fairly substantially others will barely be bent at all. We use a special wooden bending tool that positions the radius for bending in exactly the right location. We slip it over the tab and simply give a little tweak. 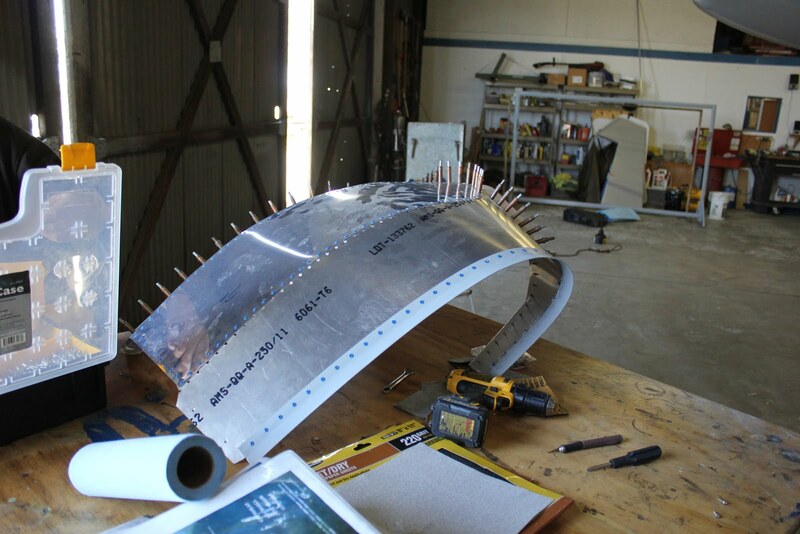 All of the tabs will be bent individually, then fit onto the aircraft, and then re-bent to the final shape. 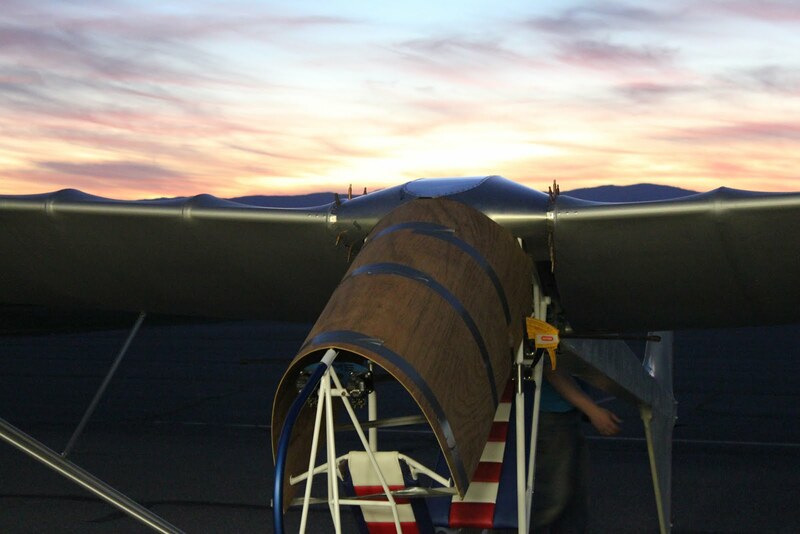 With both of the wing fairings in place we now can start to see the interface and the shape taking place. 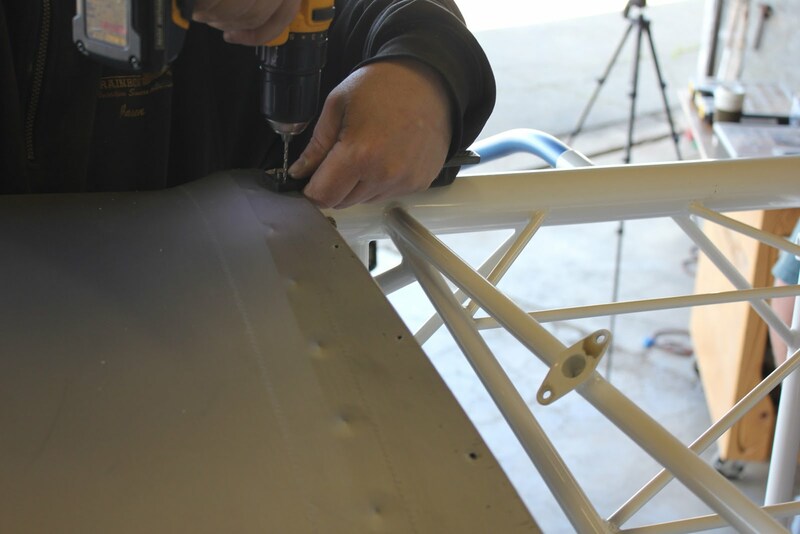 We use wood screws to attach the tabs to the center section and we use Cleco’s to attach the fairing to the inboard wing truss assembly. An aft view of the fairings after proper positioning. 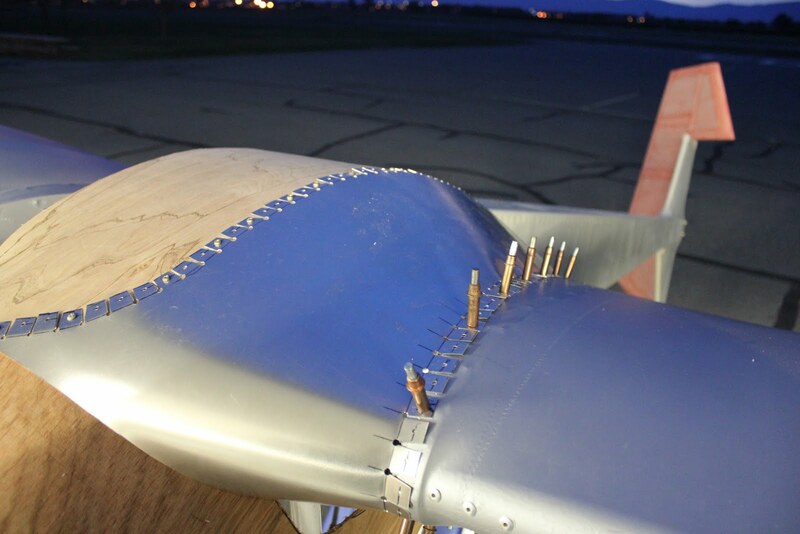 A top view shows how the fairing assembly interfaces with the fuselage boom. 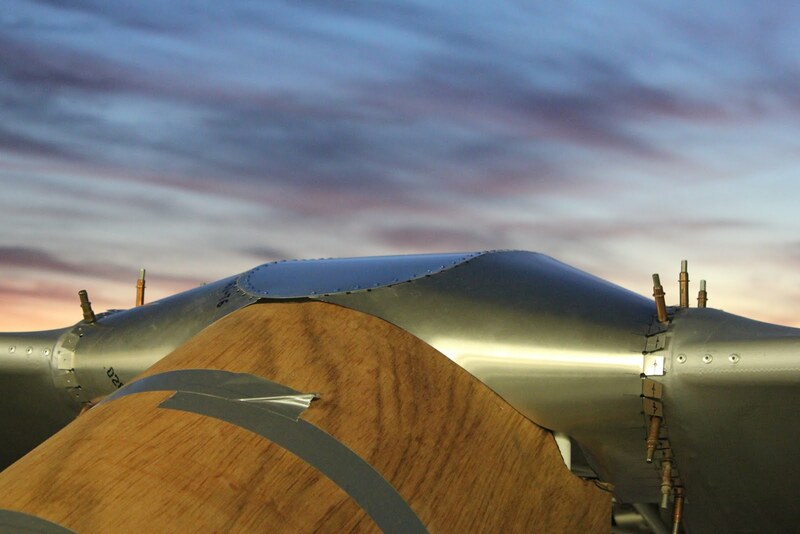 The next step is to insert the aluminum top piece that will bridge the gap between the two side fairings. In this case were using a piece of .020 2024 T-3 aluminum that we have run through the roller to give it a permanent shape that corresponds with the center positioning block. 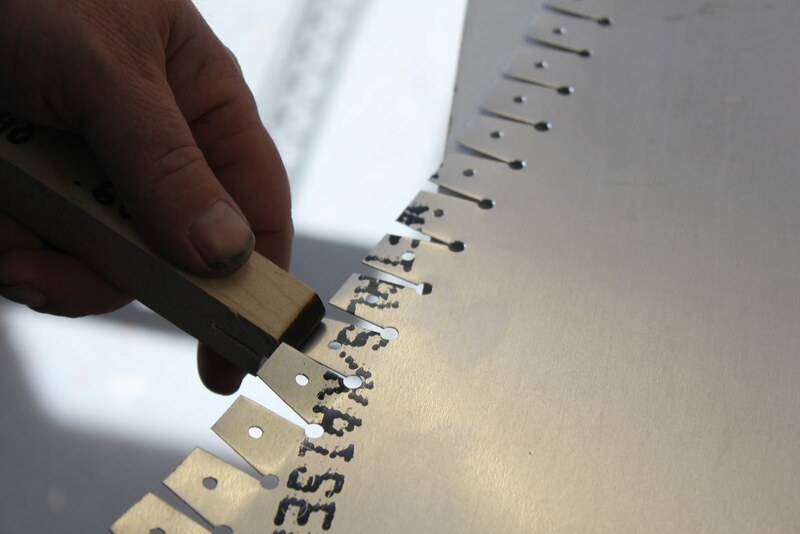 We initially cut the width of the center section with extra material and using a hole Finder we will position the center section sheet in place drilling and screwing it in place starting at the back and moving forward. 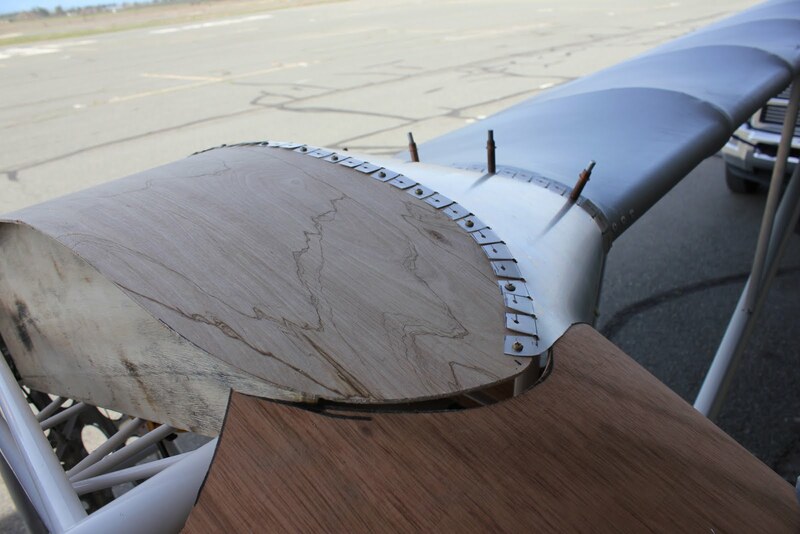 Once we have matched the the center section to fit the wooden positioning block and align all of the rivet holes on both of the forward fairings we remove the fairings, remove the center positioning block (the fixture made from wood), and then reinstall the two fairings on to each wing. Next weekend take the rough cut aluminum center section and Cleco it back into position using fairly tight Cleco pattern to maintain rigidity. A look at the center section piece from the front shown with the initial trimming complete. 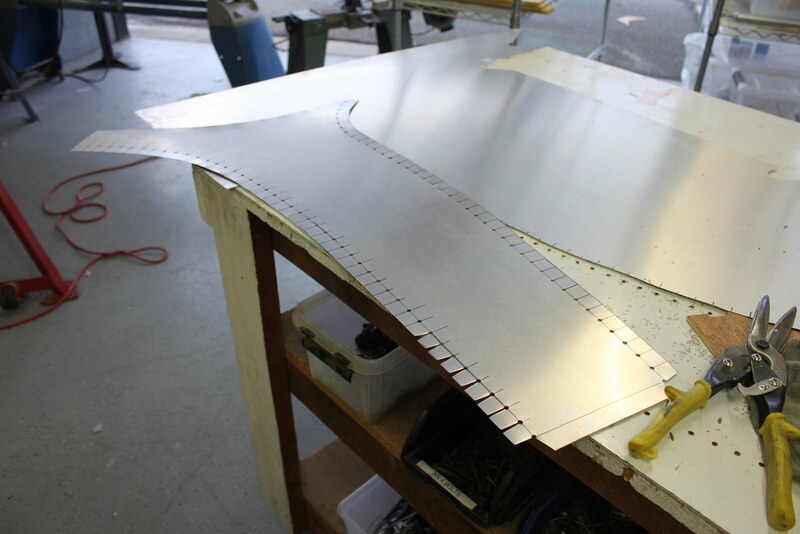 We will end up taking the top section off 2 to 3 times to get it trimmed just right so that it interfaces well with the side transition sheet-metal. 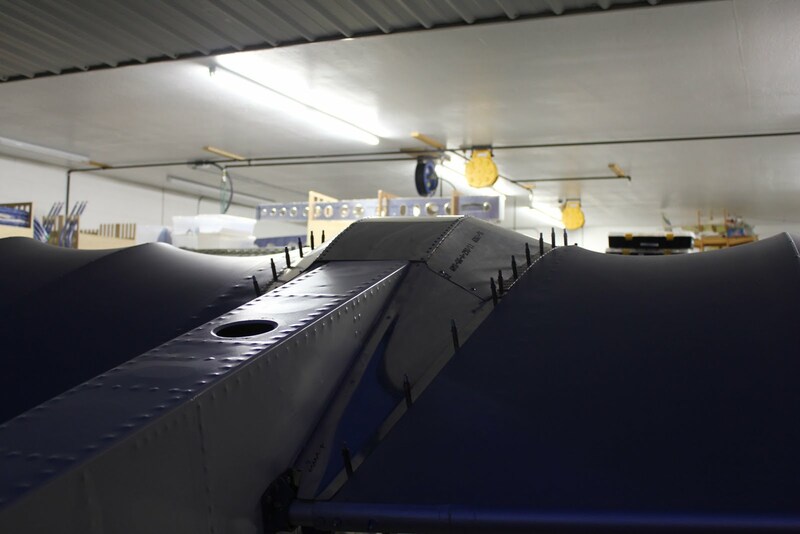 After the top section is installed in place we can see from the bottom how we have a large cavernous section above the wing box area that has more than enough room for the (BRS) ballistic parachute. 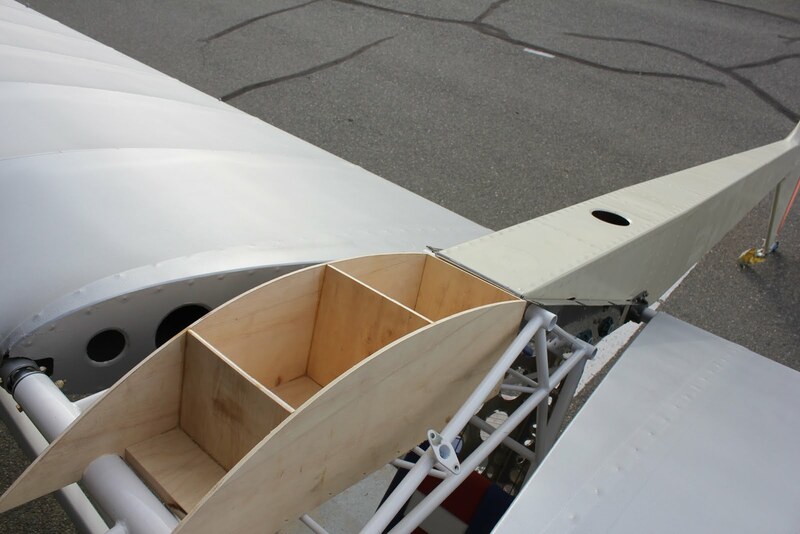 It takes a stool on all four corners of the wing center section to be able to work on top where the fairing is located. 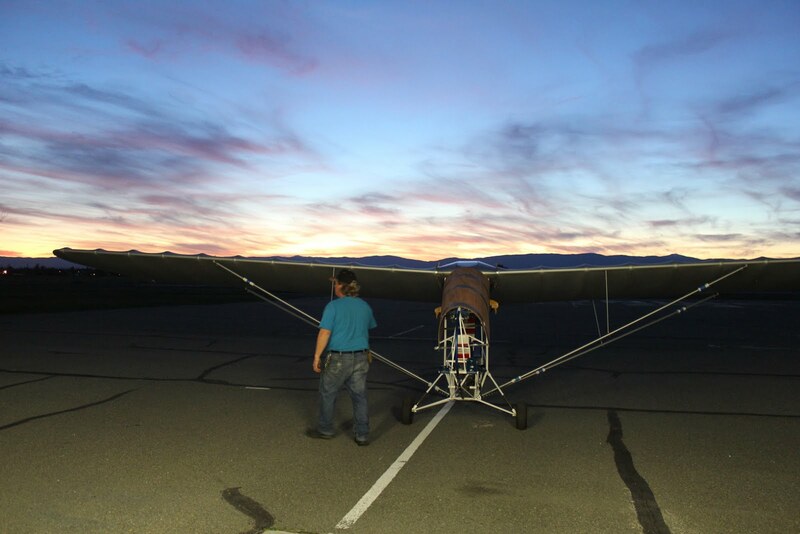 It didn’t dawn on me until later that we simply could have removed the landing gear and set it down so that we could reach a little bit easier. 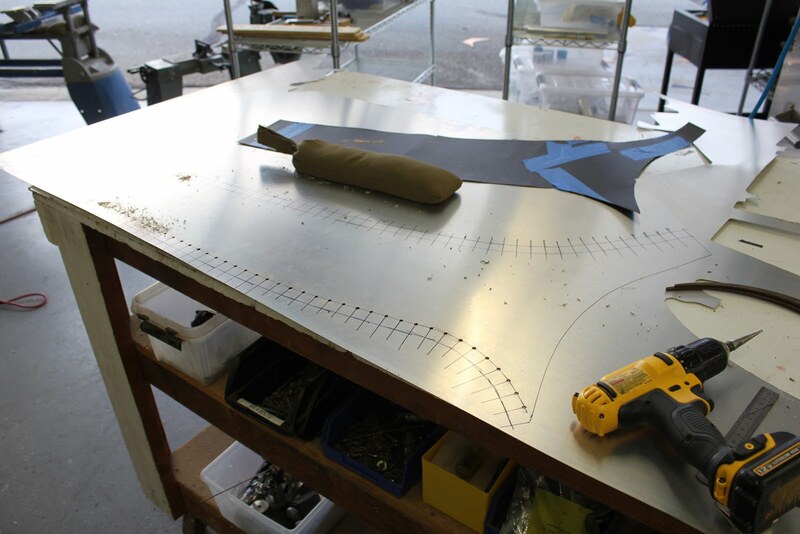 Once you’re satisfied with the fit of the center section we can riveted in place using 1/8″ pop rivets. 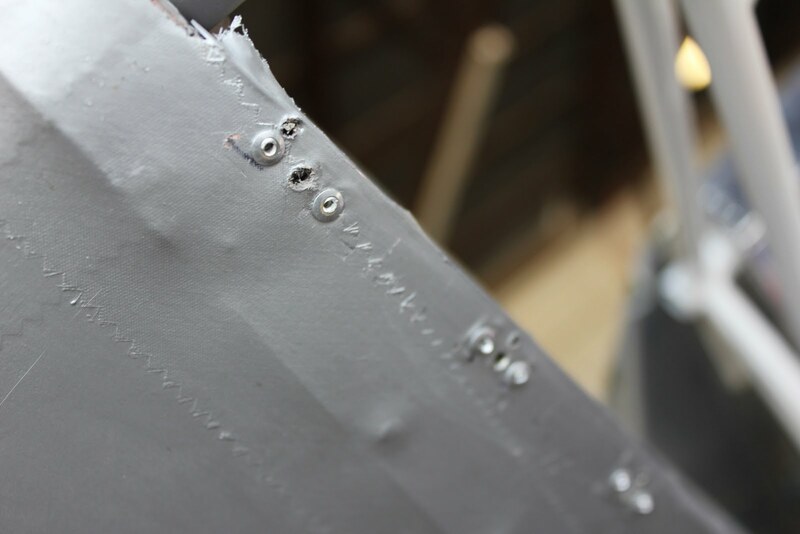 once the top section is secured with rivets it becomes very rigid. We probably won’t need more than just a few bulkheads. An overall look at the fairing. The leading edge transition segment, we will be able to start on the interface between the windshield and the fairing tomorrow. We’ve had about a week of really good 70° to 80° weather. it allows us to work fairly long days and make a lot of progress. 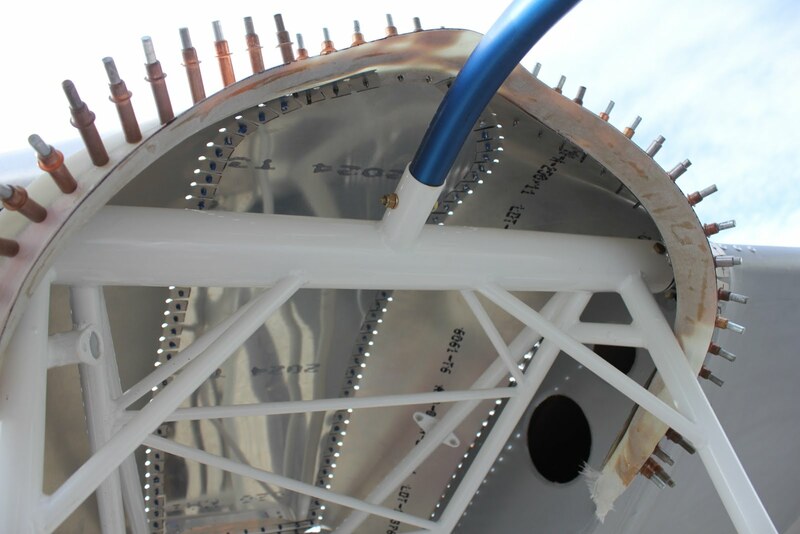 A little broader view of the center section fairing and the windshield transition area. 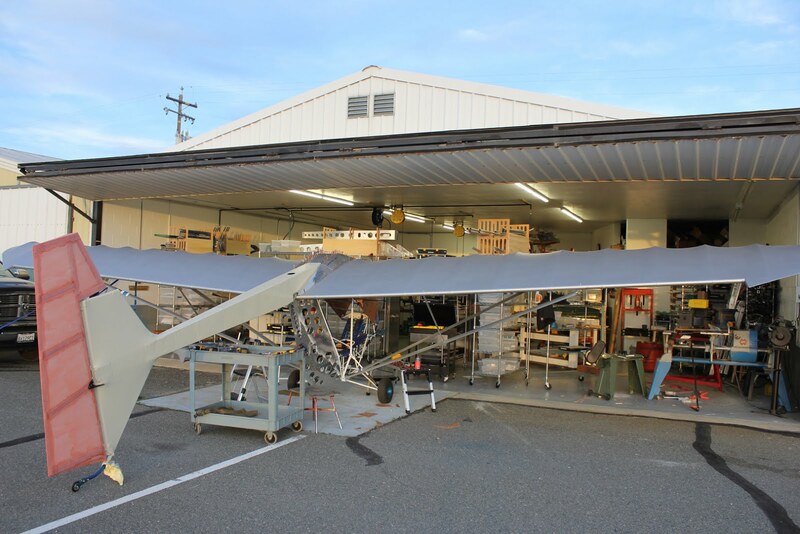 Another beautiful day and were ready for the next step in the process of fitting the fairing to the fuselage and windshield. We are going to make a fiberglass fairing that will interface the fairing with the front windshield. 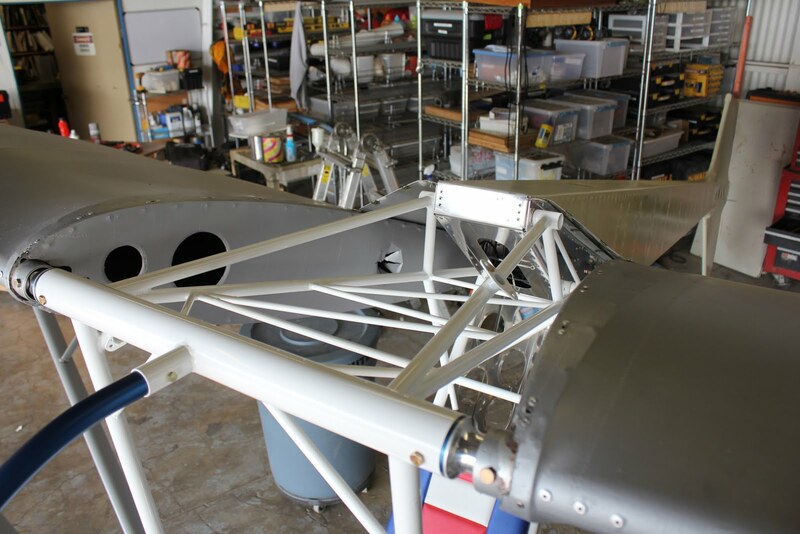 This will allow us to pull the top fairing with a few screws while leaving the front windshield on the airframe when we pull the wings for transport. 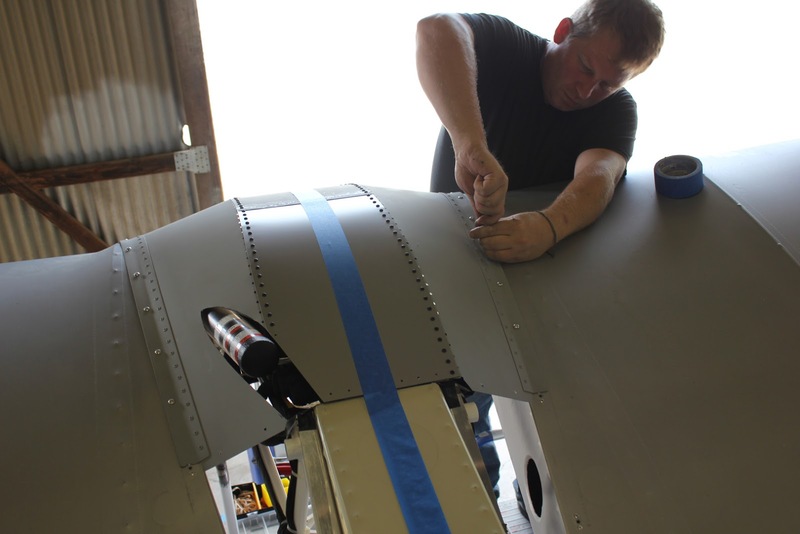 First thing were going to do is were going to take and apply duct tape over all of the areas where we are going to create the fiberglass fairing strip. 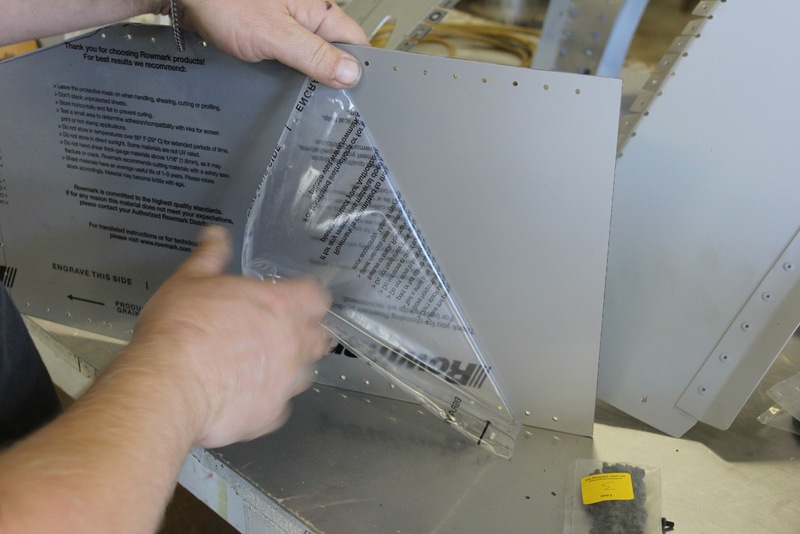 This will protect of the metal and act as a barrier during the fiberglassing process. 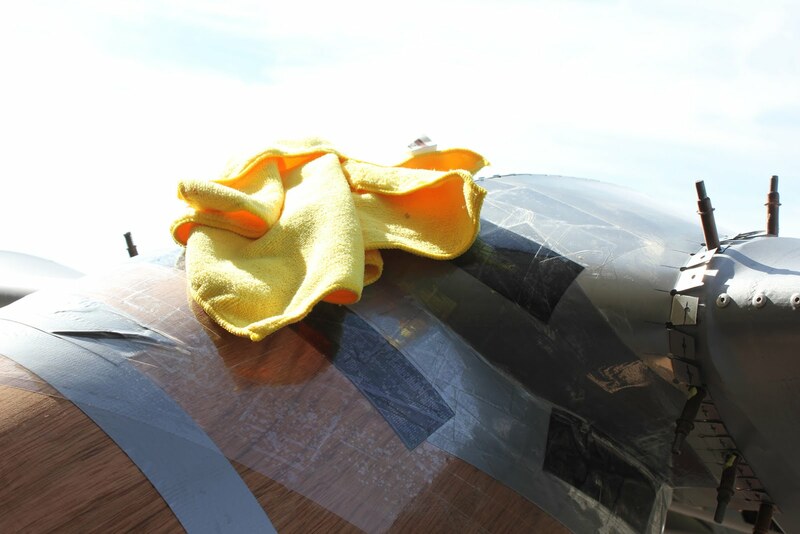 After we apply duct tape as a base layer we apply a second layer of clear packing tape over the top of the duct tape and even further out onto the rest of the structure. 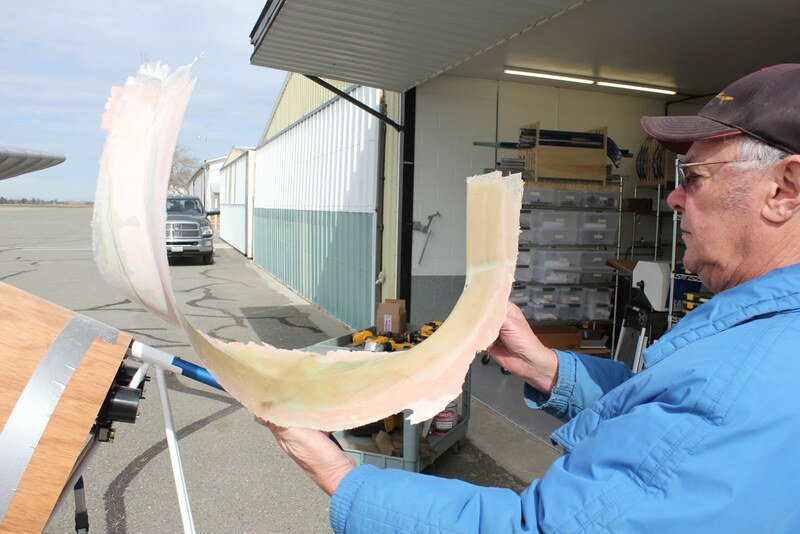 This packing tape is very slick and smooth and does a great job of acting as a release agent for the fiberglass when we go to pull it from the rest of the frame. The next step is to cover the UPS packing tape with several layers of mold release wax. In this case any hard wax for automobile will work well. We rubbed the wax on and let it sit for about one hour before rubbing out the wax with a microfiber cloth and then reapply another layer of wax. With the UPS tape normally 3 to 4 coats of wax is sufficient. 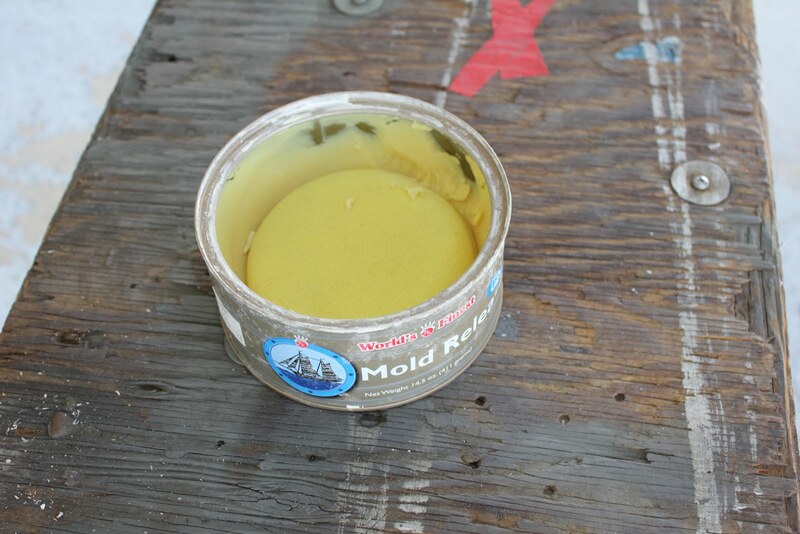 When we are working on a mold we will do as many as 10 coats of wax before we begin the layout process. 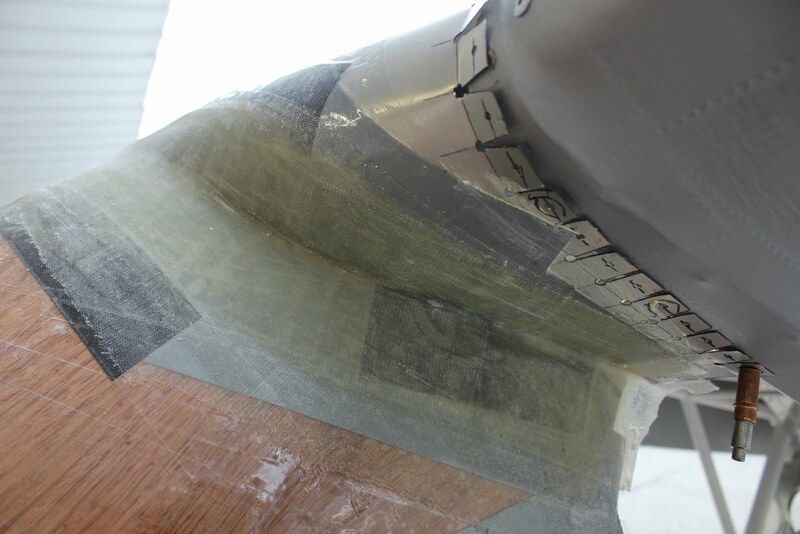 This is a quite is critical because all of the underlying structure is a throwaway structure once we peel the tape away even if it sticks to the fiberglass component we can work it loose from the underside by removing the tape from the structure. 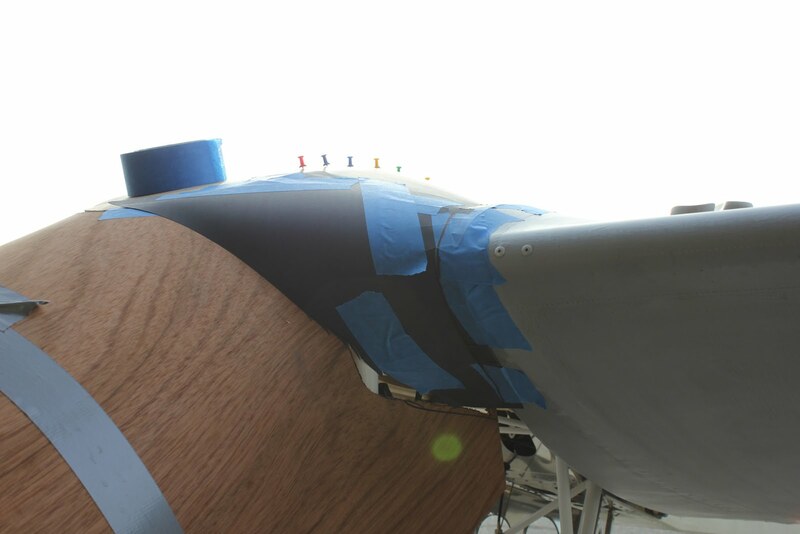 While we are waiting for the wax to dry we add an additional reinforcing bulkhead at the aft fairing where it interfaces with the fuselage boom. this will add a little cross stiffener and strengthen the fairing at the aft end. The front end because of its compound curve associated with the wraparound fairing doesn’t need as much reinforcing. 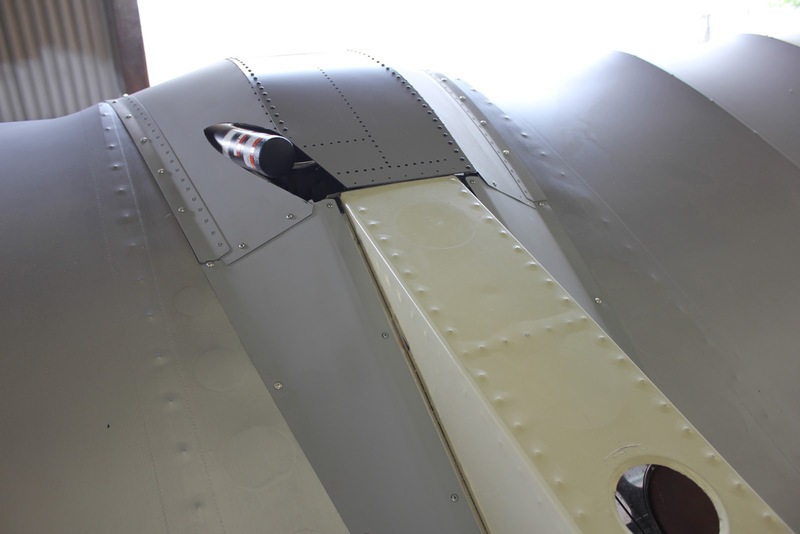 A view from the top of the fairing showing the rivet pattern across the aft end of the upper flat portion of the fairing where transitions into the fuselage boom. 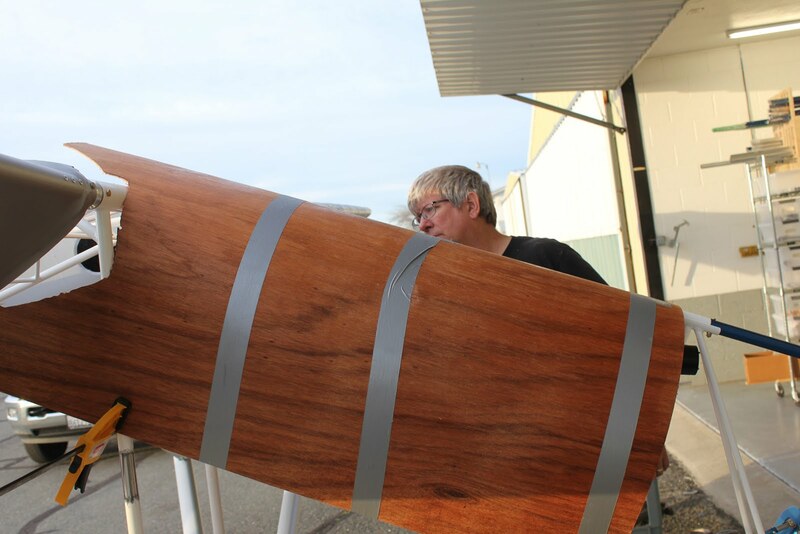 we prepared for inch-wide fiberglass strips that have a fairly loose weave that will be used to make the fiberglass transition fairing. 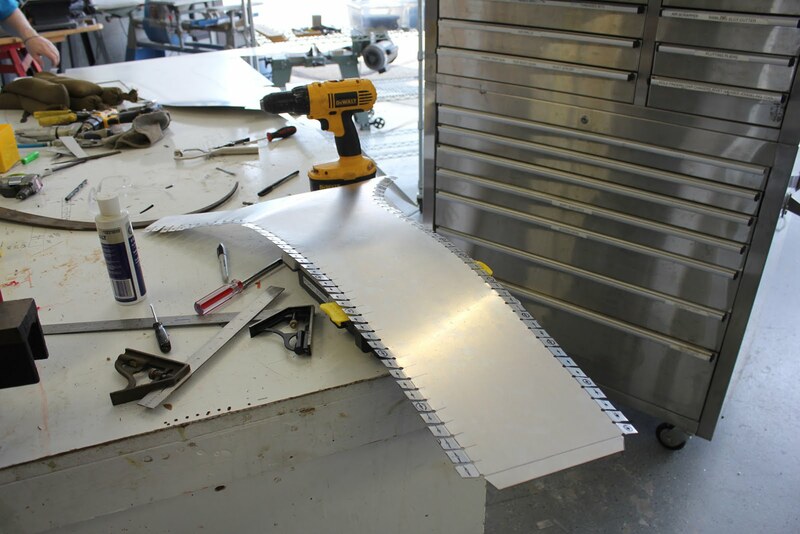 These strips are cut on a 45° bias which allows them to mold and contoured to compound curves very easily. It also substantially increases the strength across the joint from the two surfaces. Rubbing out the third coat of mold release wax getting ready to start the layups. Today were going to be using Jeffco epoxy. 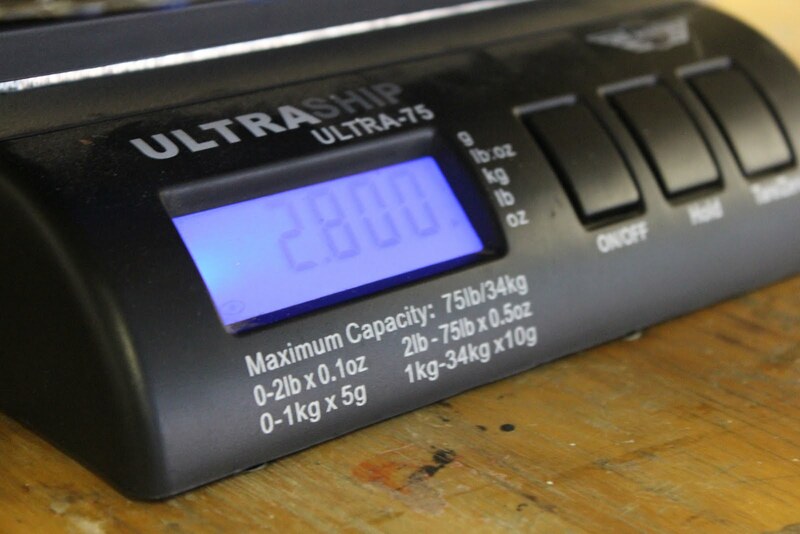 we have an epoxy ratio pump that distributes the epoxy in the exactly perfect ratio which makes the job pretty easy compared to mixing by volume or using scales to measure out the hardener and the epoxy. 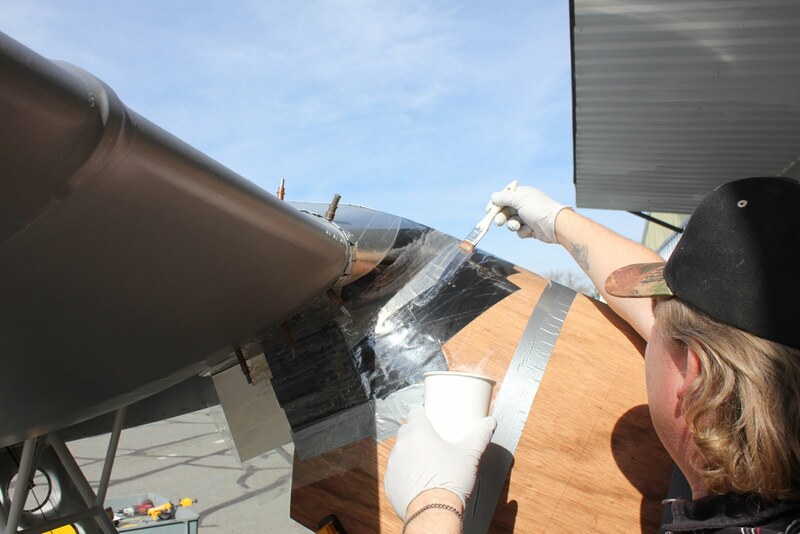 Jason begins laying the epoxy directly onto the waxed surface applying a fairly liberal coat of epoxy allows us to place the fiberglass cloth directly on the surface and have it stick. This is important on the services that are vertical or inverted. 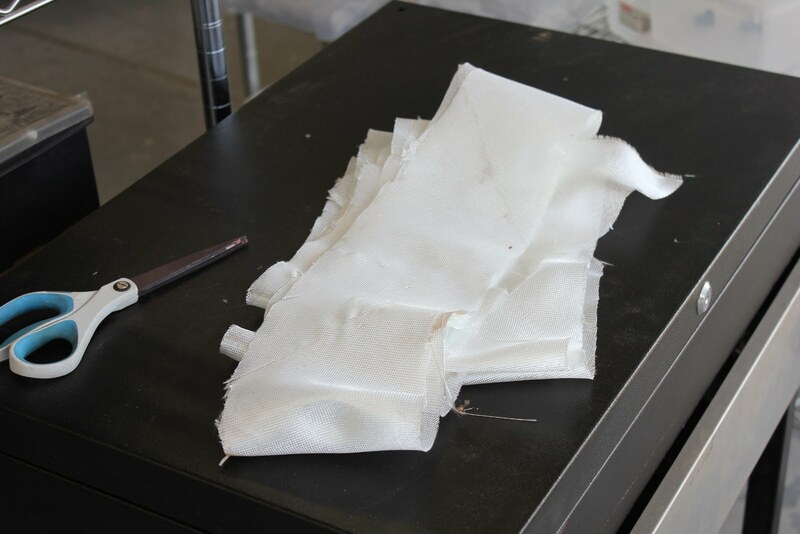 In this picture here we have two layers of fiberglass cloth 4 inches wide. We will continue laying up and overlapping each layer of cloth until we have a total of eight layers. We now have eight layers of cloth. They are substantially wet out and have a lot of excess resin with in the cloth layers themselves. 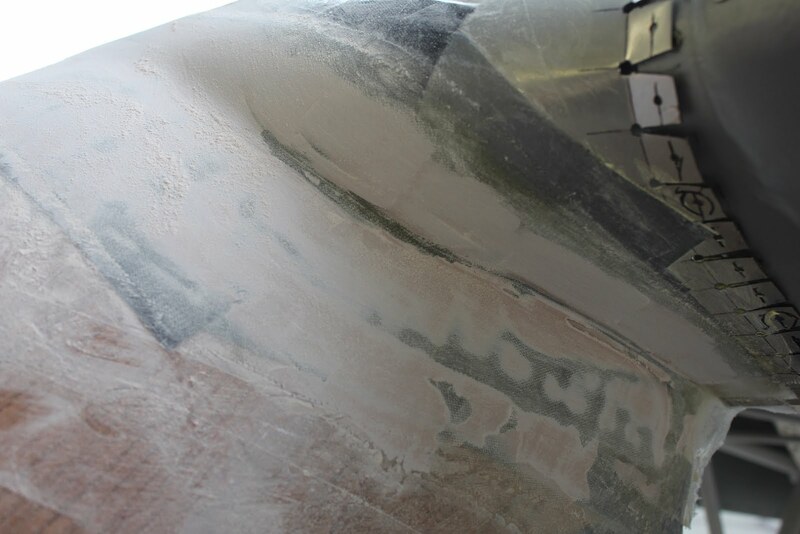 In order to improve the strength we want to extract excess resin from the layups before it has a chance to cure. we use paper towels as blotter cloth to soak up the excess resin. 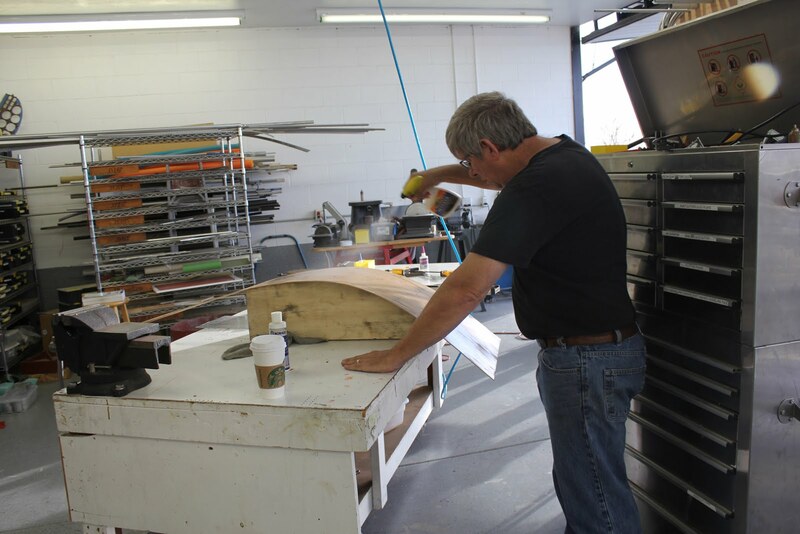 It will take probably 50 to 100 applications of blotter cloth applied to the fiberglass layups while heating with a heat gun. The heating makes the resin flow very easily and can be sucked up by the blotter cloth. We will apply the blotter cloth let it soak up a little bit of resin then pull it loose and throw it in the trash, then apply the next layer and so on until we no longer get any saturation into the blotter cloth during its application. when you’re doing this it’s important to not overheat the resin as you will substantially affect the structural integrity should you “cook it”. 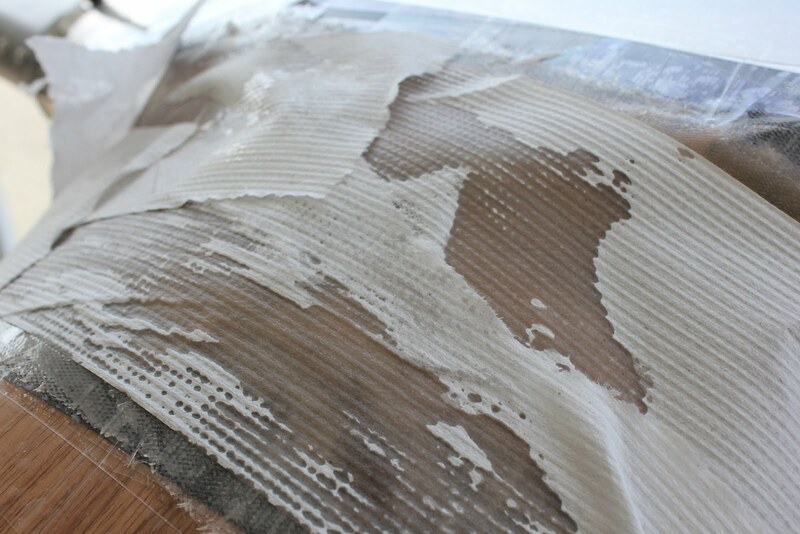 In this picture here you can see after applications of the blotter cloth and soaking up the excess resin the fiberglass layup’s take on a matte finish. We will now give the layup a total of about four hours of curing time before we proceed to the next step. 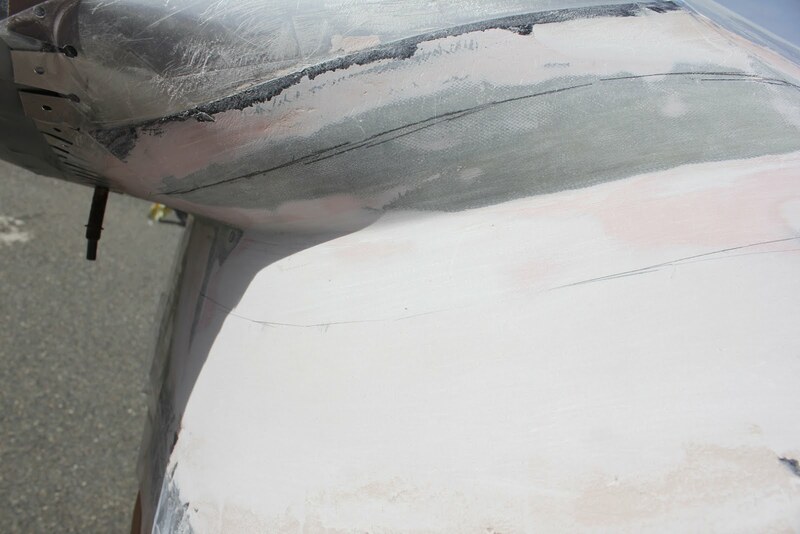 Even though the fiberglass resin has not completely cured it’s hard enough that we can now start to work it a little bit and prepare it for application of body filler. as long as we leave the fiberglass on the structure we will not be over stressing the still “green” layup. We will start off with a fairly generous application of body filler. We use a professional grade lightweight body filler similar to bondo. 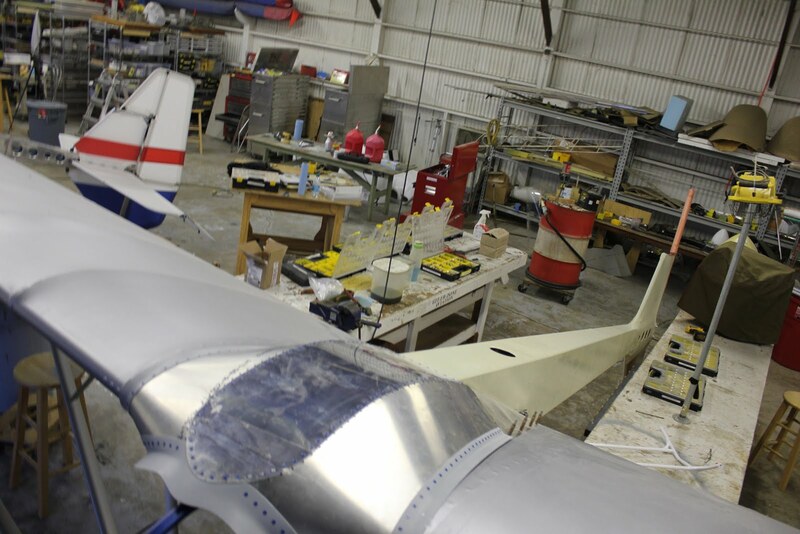 once we have applied the body filler we will stand down through the filler and into the fiberglass structure. 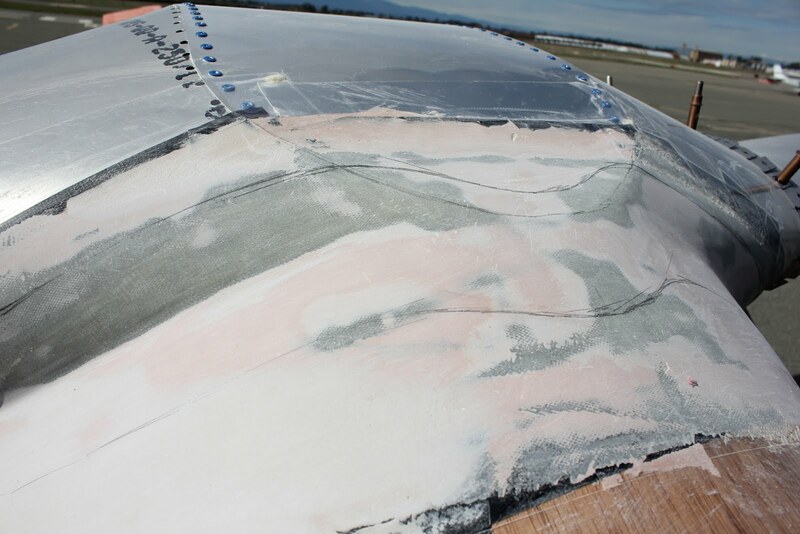 We would like to have the least amount of body filler as possible and we have applied an excess amount of fiberglass cloth so sanding into the first 2 to 3 layers of fiberglass cloth will not affect the structural integrity of the fiberglass piece. 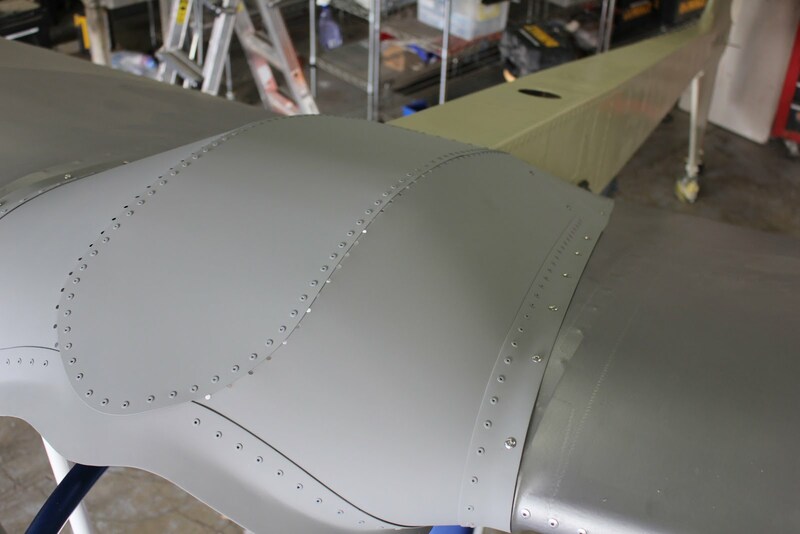 we will sand in between each coat of body filler until we have a relatively smooth surface. This will probably take between 5 and 8 individual applications of body filler to finally work out all of the small imperfections. After the rough sanding and trying to remove as much of the body filler as possible we switch to a smaller grip of sandpaper and begin the finish sanding process. 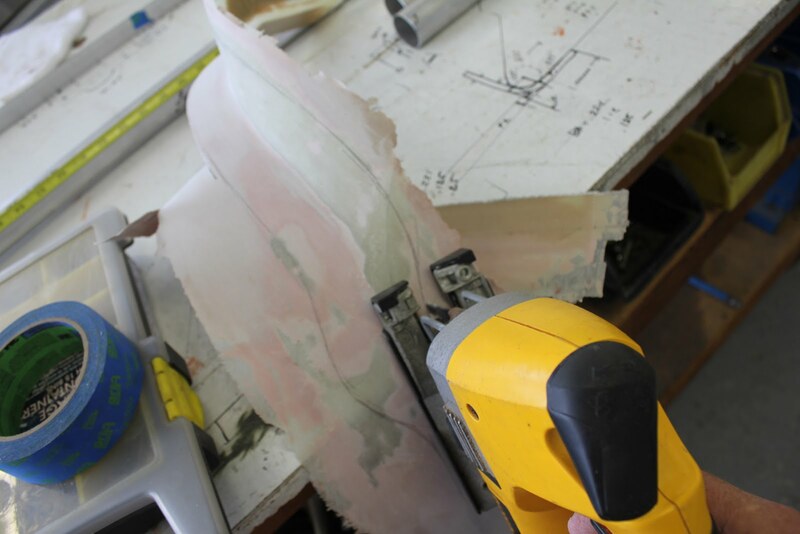 After we finish the basic sanding to the primary contour, and have switched over to the smooth sandpaper, it’s now time to lay out the cutting pattern that we will use on the fiberglass. We will leave a 1 1/2 inch border around both surfaces. We use a guide block to give us the initial distance in shape and then mark with a pencil. 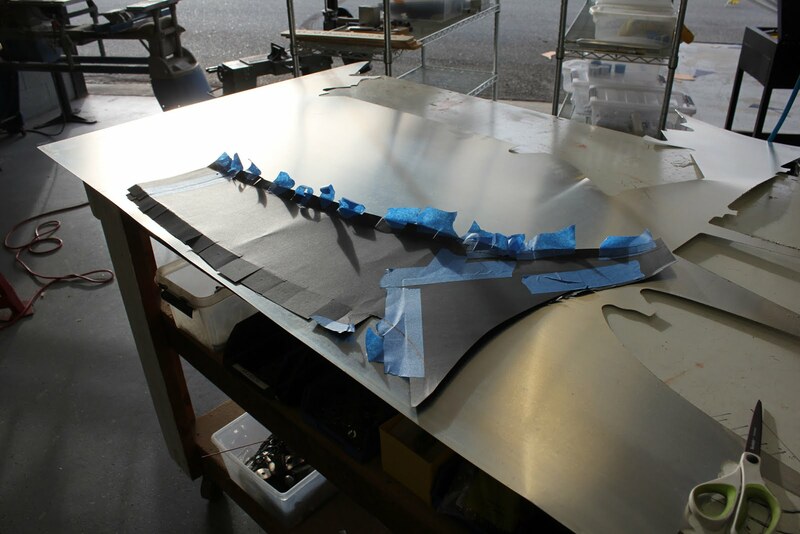 Once we have the layout of the cutting pattern, we can remove the fiberglass from the rest of the air-frame. 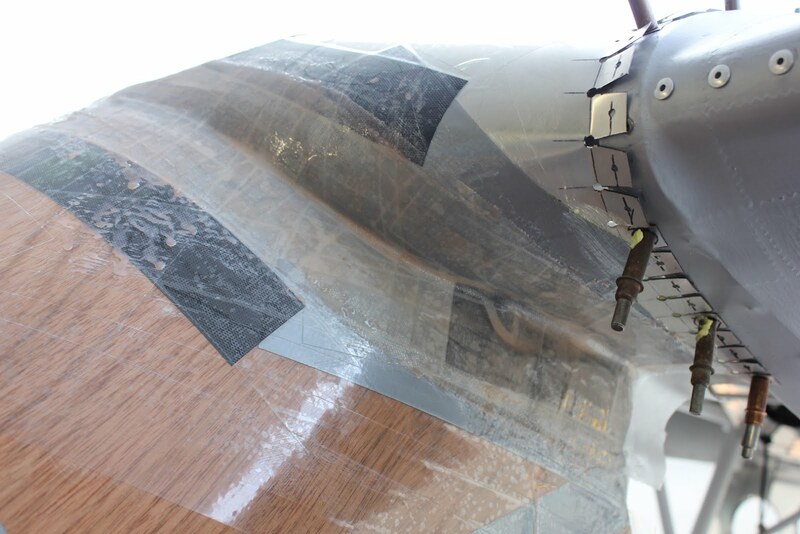 Having waxed the surface, the parts simply peels away from the aircraft. 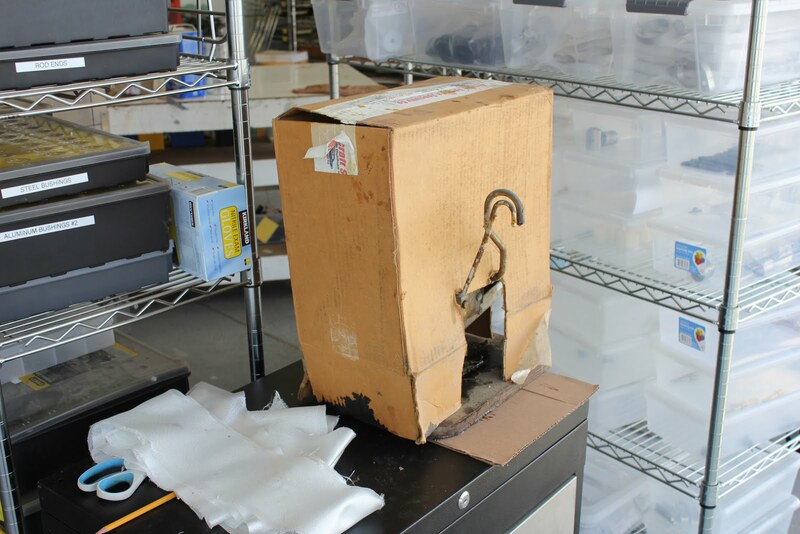 In this picture we can see how completely the part separated from the UPS packing tape that we used as the mold release. The part separates without any deterioration of the underlying surface. 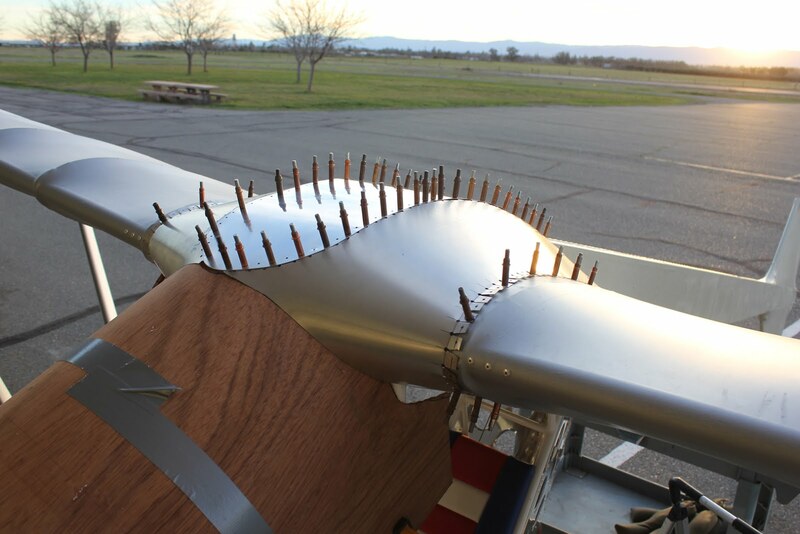 Part shown removed from the aircraft. It turns out it’s about six layers of fiberglass cloth. 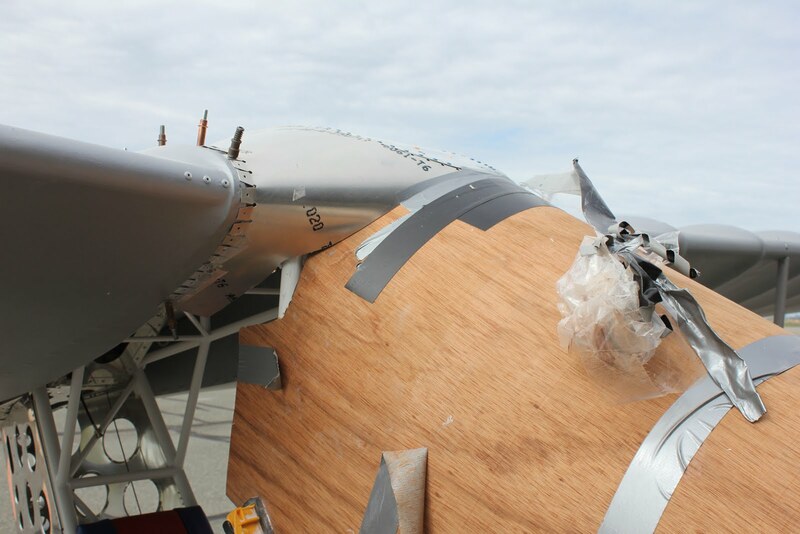 The next step is to remove all of the duct tape and UPS packing tape from the rest of the aircraft. What works even better is a saber saw with a composite bit. 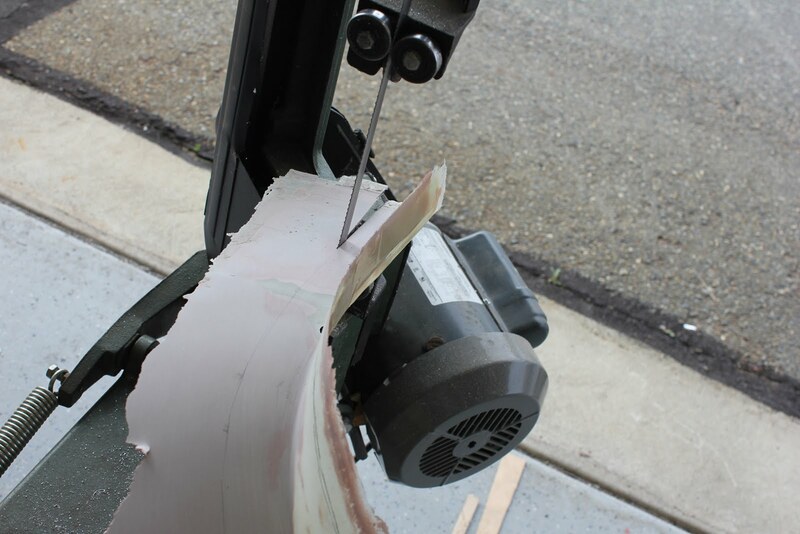 The fiberglass is pretty hard on the bandsaw blade. 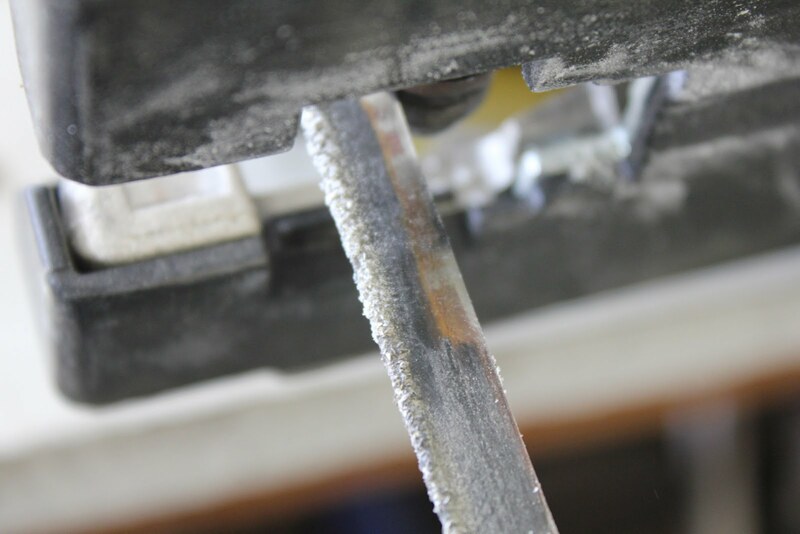 The composite bit is simply a steel blade with the leading edge coated with diamonds. Once we have cut the profile shape with the saber saw were left with the final product. Weighs only a few ounces. We will next take it over to the sander and cleanup all of the edges. 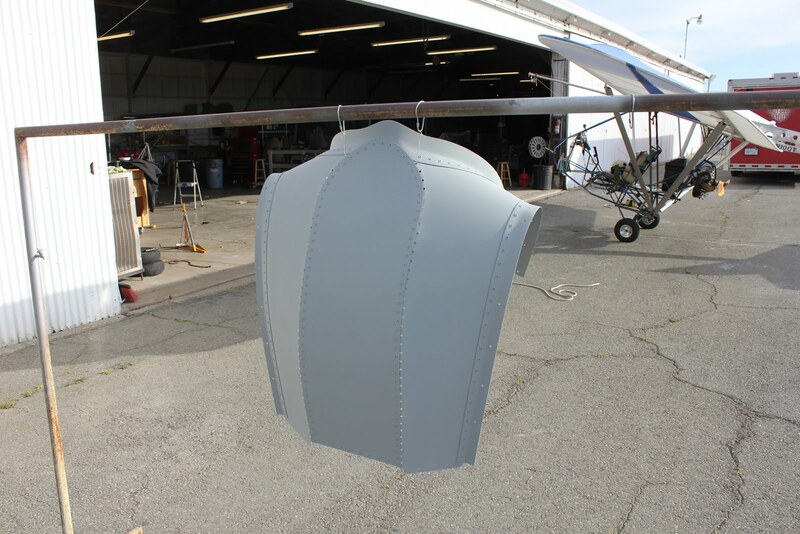 Once the part has finished being sanded will put it back onto the aircraft and using a bout a 1 inch rivet pattern drill and Cleco the fairing to the upper metal fairing. This pattern should be continued along both sides of the fairing starting in the center and slowly working one riveted a time following up with the Cleco which will force the fairing tightly against the windshield and center section fairing. 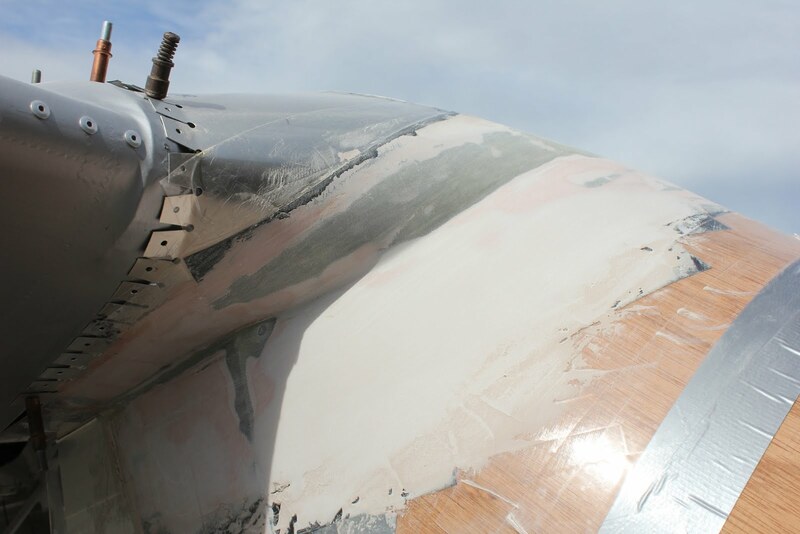 Once the fiberglass transition fairing has been Cleco did to the airplane we can remove the dummy windshield. Looking from the bottom side we can now see the relatively simple cavity left behind which will have more than enough room for the BRS ballistic parachute . 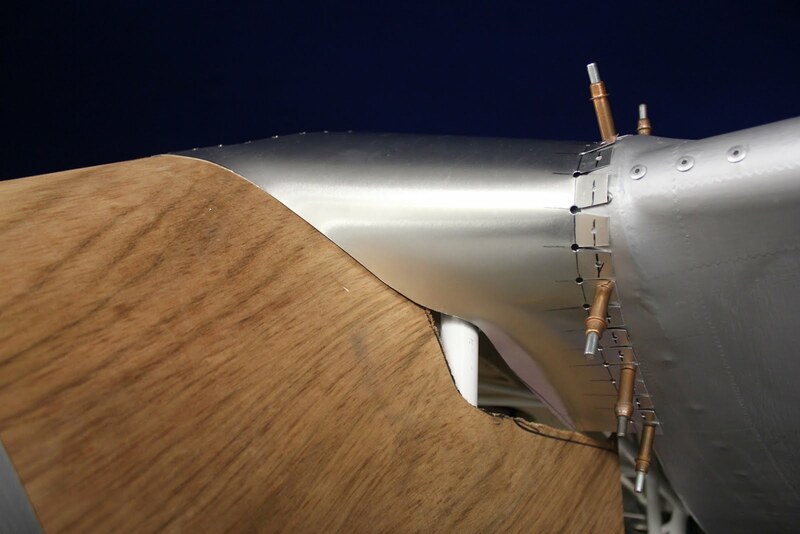 The next step will be to make the reinforcing strips that will be riveted to the sides of the center section fairing making it much more rigid and giving us more material to use as the attachment structure.. This is made from .040 2024 T-3 aluminum and will be held in place with approximately 6 screws per side once it’s riveted to the fairing. 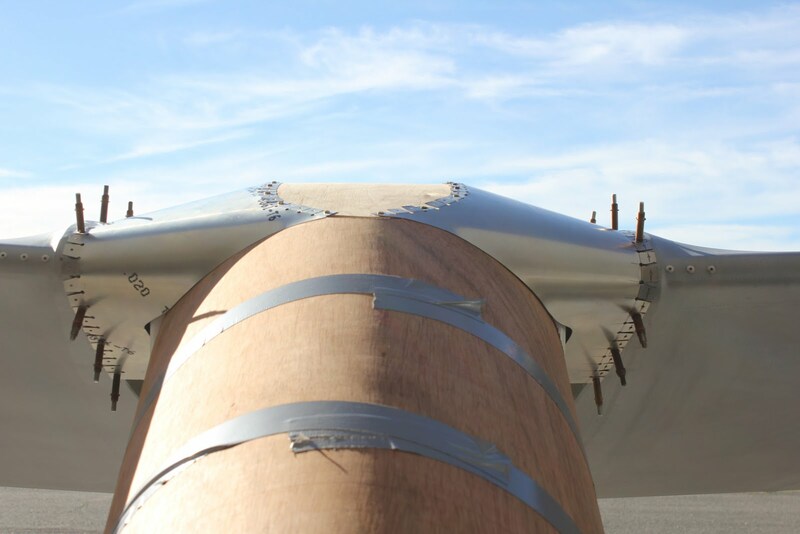 The center section fairing is now rigid enough with the side strip installed that it can easily be removed from the aircraft. 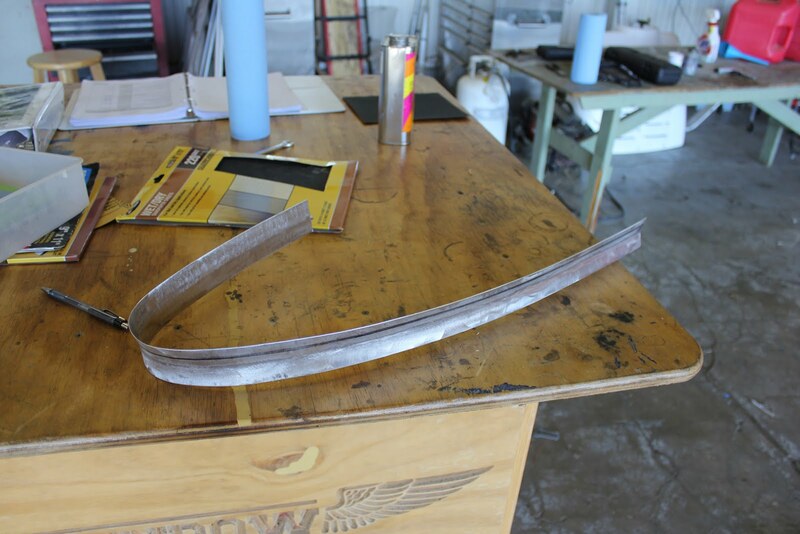 Once we have bent the .040 strip we will cut off all of the individual tabs that we bent to hold the faring in position while we were working with it during the earlier stages of construction. 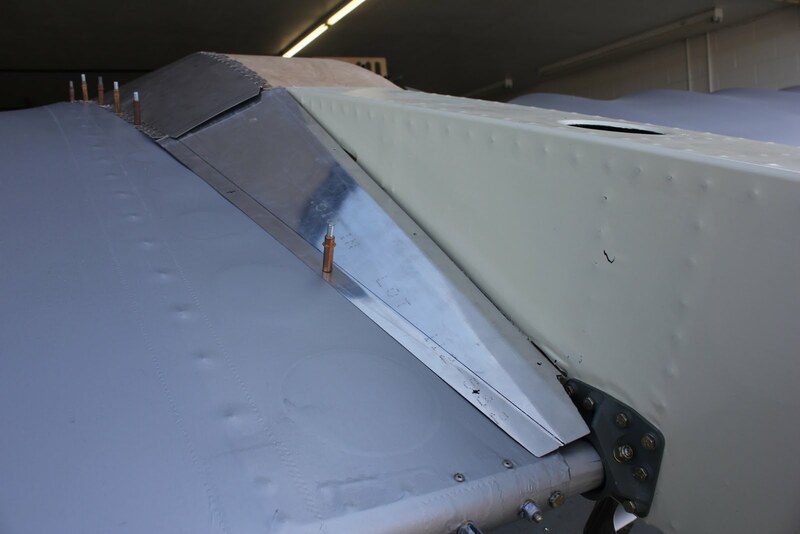 This will leave the new .040 strip providing a very clean edge to attach to the airframe. With the right hand wing fairing strip in place we can start to use a whole finder to position the fairing in place and drill for the screw holes. 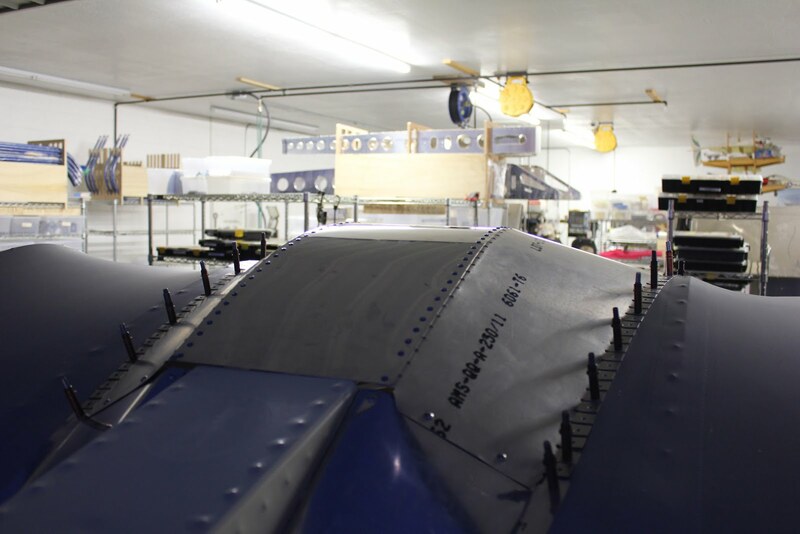 We finally have all of the customer airplanes out of the shop and are able to now work on the EMG-6 in the main hangar. 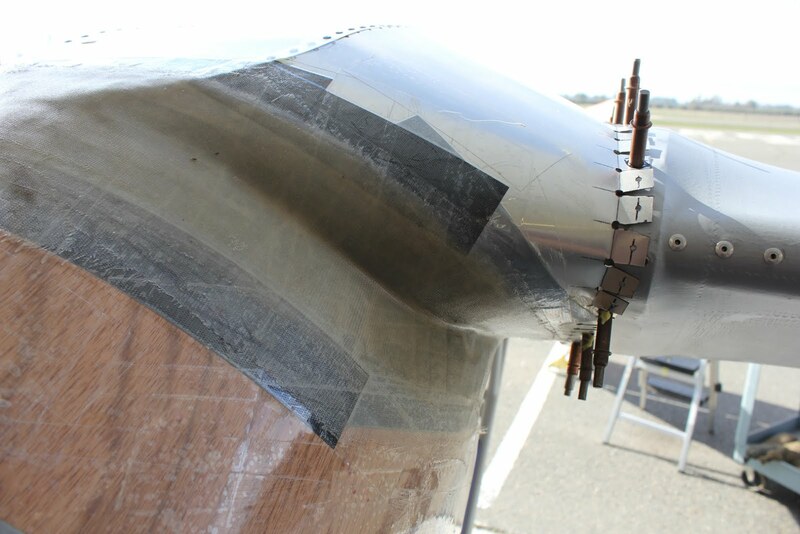 We have finished bending up the fairing strip for the left side. 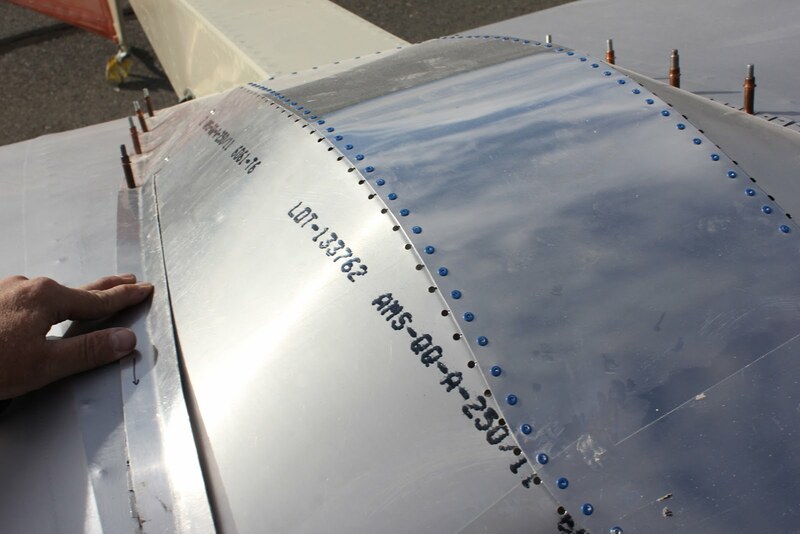 We will now Sand and Scotch Brite this part and drill and Cleco it to the center section of the fairing. The left side fairing strip in place.. Next we will have to remove the strip and finish it before riveting it to the center section aluminum. 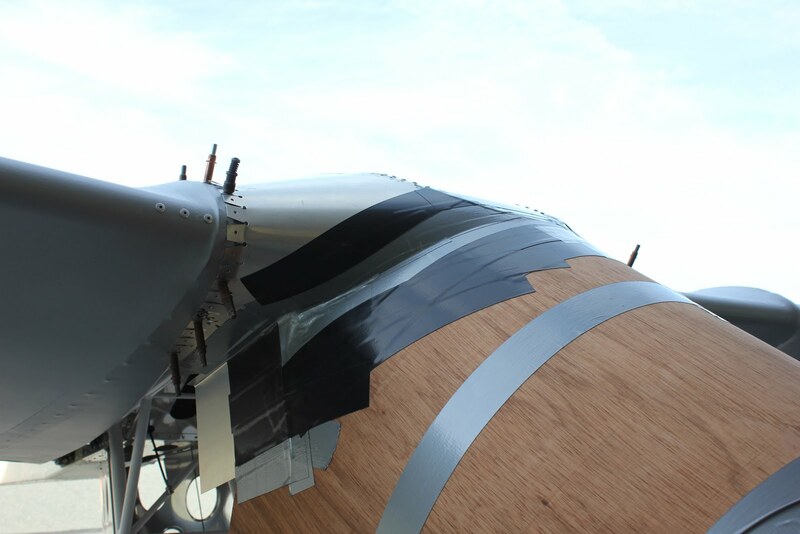 Top view of the left side fairing strip now Cleco’d in place. 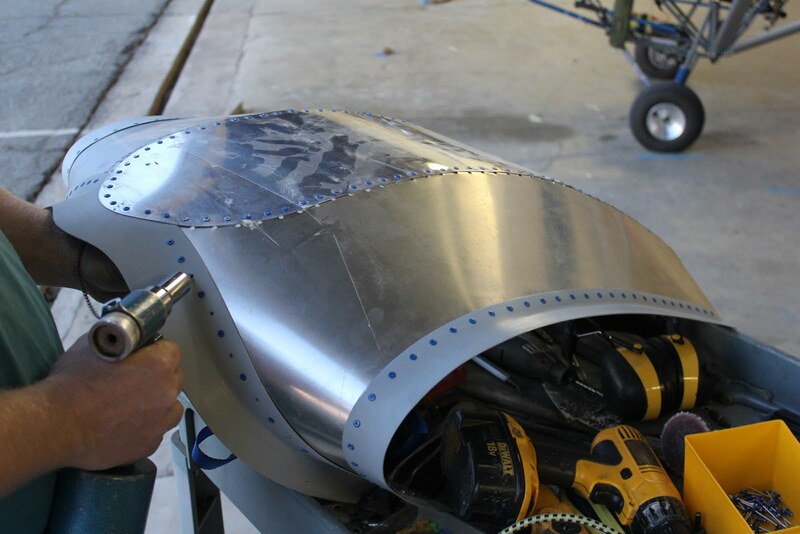 The next step will be to remove all of the reinforcing strips and the windshield interface fairing, sand and primer each of those before permanently riveting them onto the center section fairing. We have finished the right side reinforcement strip and are now getting ready to attach the left side reinforcement strip. 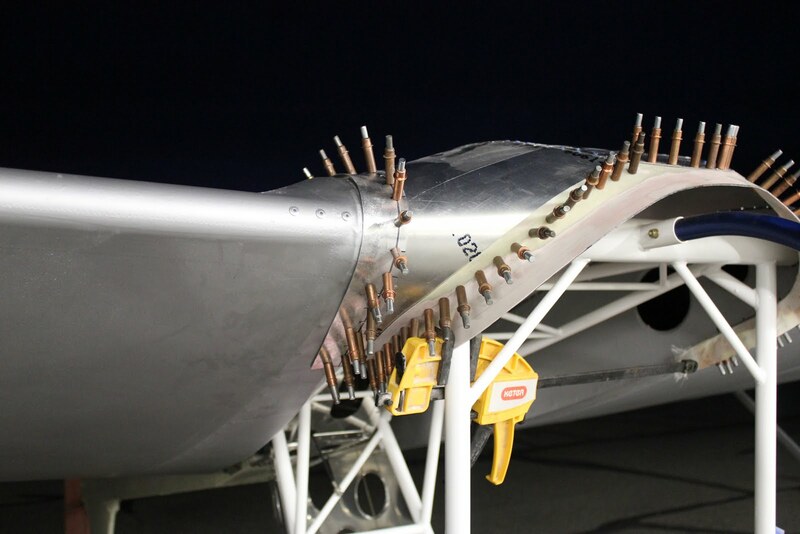 All of these rivets in the fairing are aluminum pop rivets. Because of the lightweight thin materials that were working with we need close rivet spacing but the strength of the rivets is trivial. 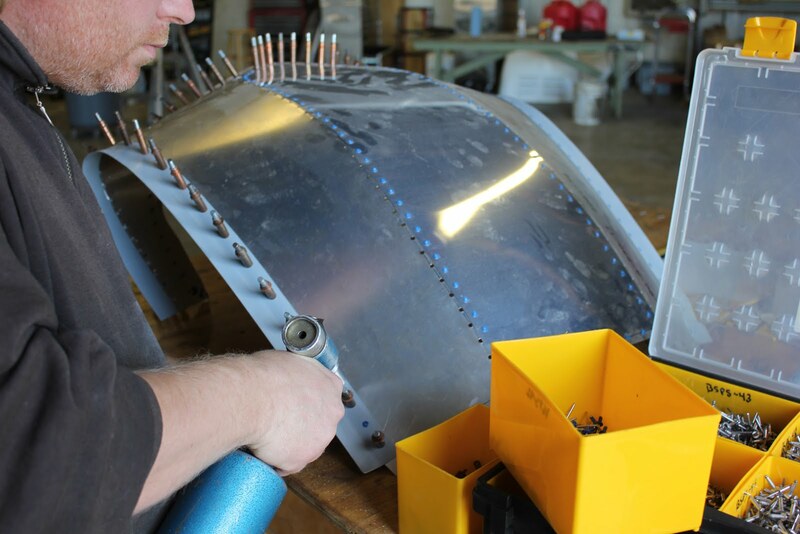 Each of the pieces that were riveting to the fairing have to be primary and sanded and ready for finishing before we can rivet them to the structure. Primarily because you can’t stand around rivets. 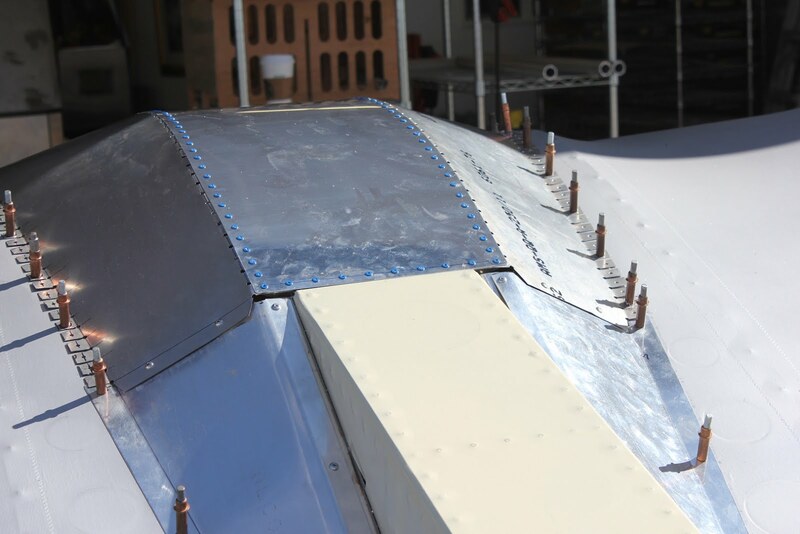 Although the finish work has to be done before you rivet something to the structure. 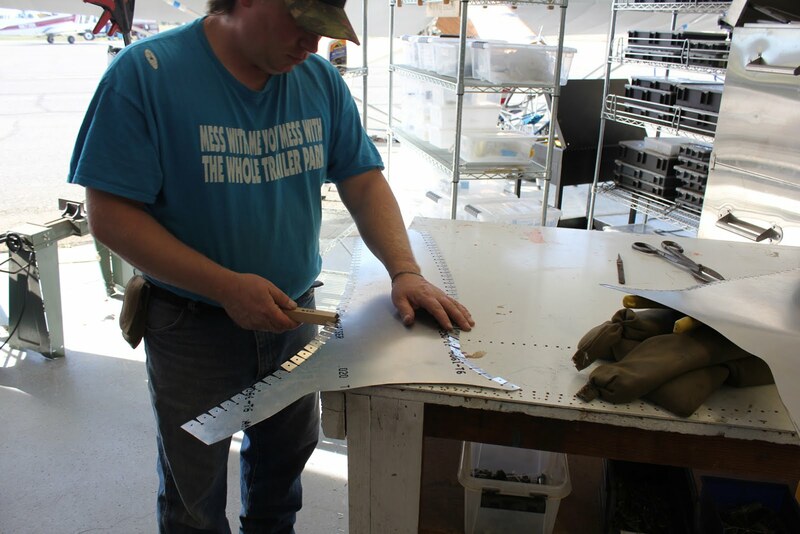 In this picture here Jason is attaching the left side reinforcement strip. We work with a Cleco in every other hole when were working with these thin materials which provides rigidity and ensures that we maintain the proper shape while riveting everything together. That will come back and remove the Cleco’s and put the remaining rivets in the rest of the holes. The same thing has to happen with the windshield transition fairing. It has to be finished, sanded, primer and ready for paint before we can begin the installation process. Once it’s ready to go we can pop rivet it into place as well using 1/8 inch aluminum pop rivets. 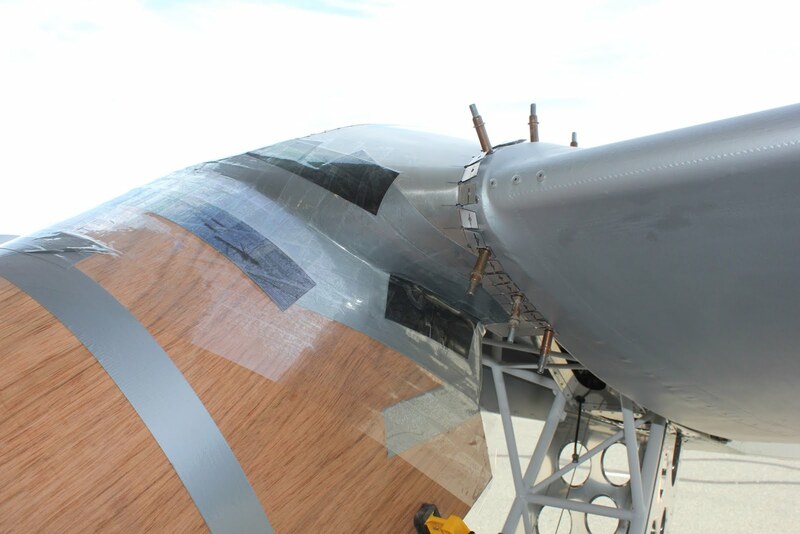 The final rivets go into the windshield transition and were almost finished. And with every part that we manufacture on the airplane, we put it through the weight test. In this case here we did pretty good. 2.8 pounds for a prototype fairing. By manufacturing this out of carbon fiber we can probably get the way to less than 2 pounds. 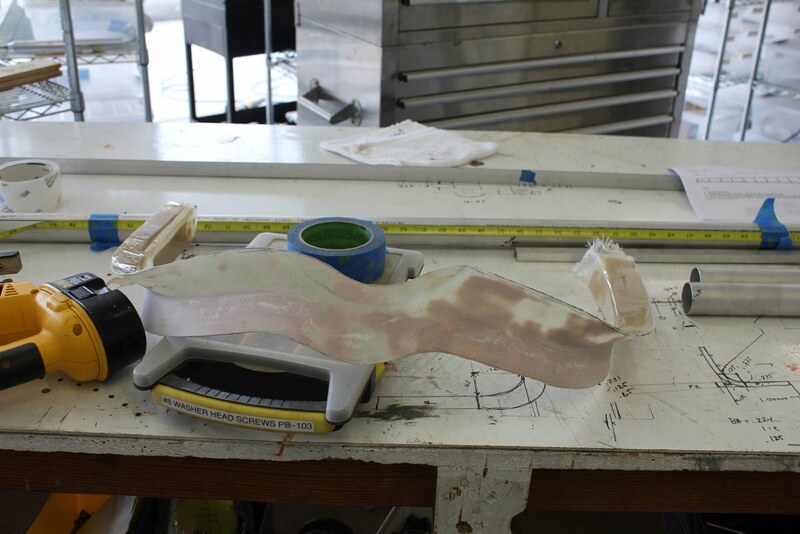 And our plan will be to make the molds and produce carbon fiber fairings for all of these components. The next step will be to remove the fairings and put nut plates in place of all the attachment holes then match up the fairing assembly. 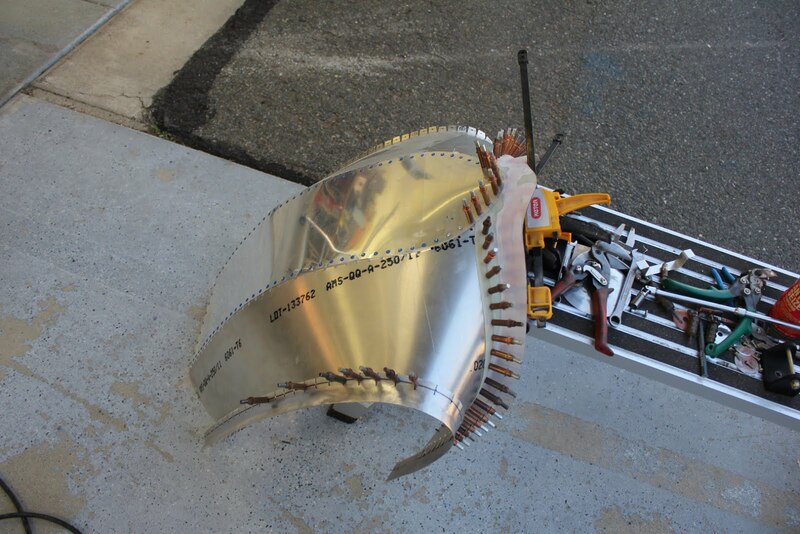 Next we need to install nut plates for the attachment to the wings. In this case were simply going to install #8 all metal nut plates. These are very lightweight and low-cost. You don’t really need it but were using a nut plate installation tool to make the process a little bit simpler. 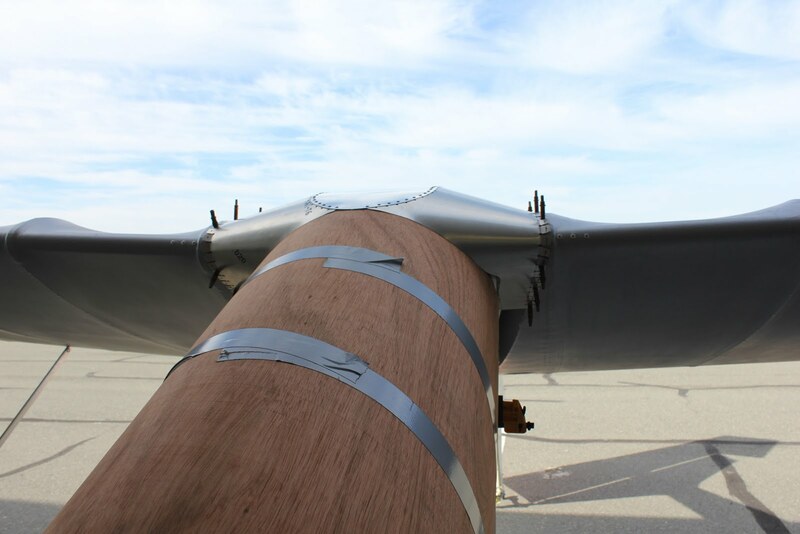 Because were going to have a 1/8 inch thick piece of foam rubber in between the fairing and the wing we can go ahead and get away with using aluminum protruding head rivets. 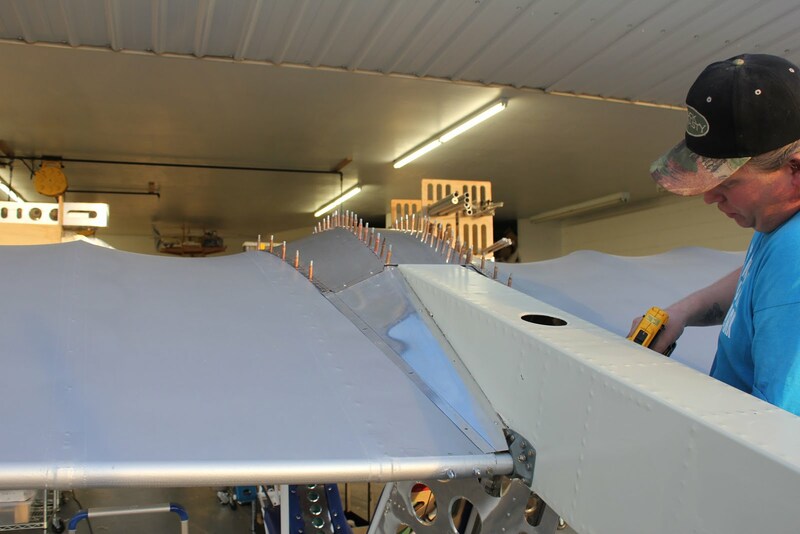 We have finished putting the # 8 nut plates Around the perimeter of the wing. 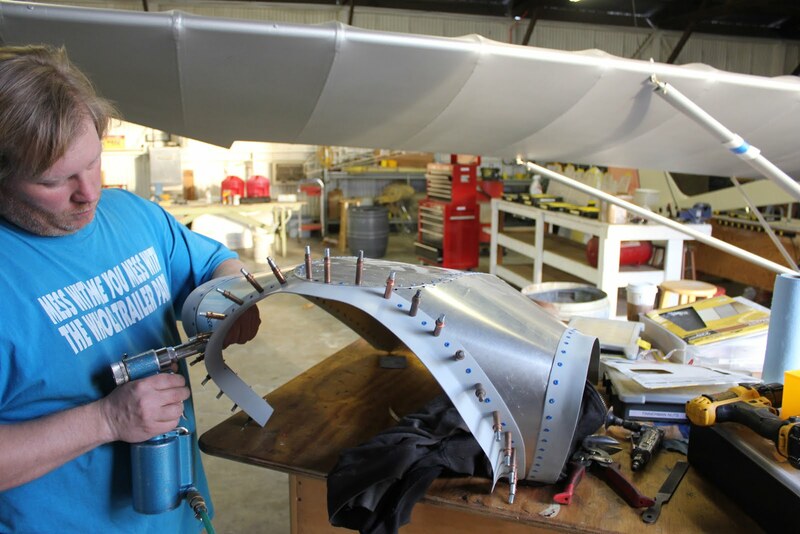 Once we have fit the fairing back up to the wing and used a whole finder to locate all of the screw holes in the reinforcements on each edge we now prep and primer the entire fairing piece. 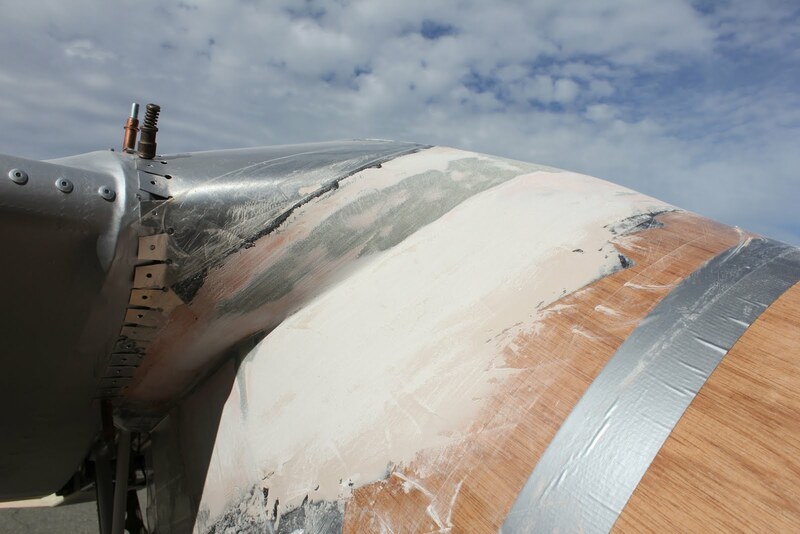 A look at the bottom side of the fairing. 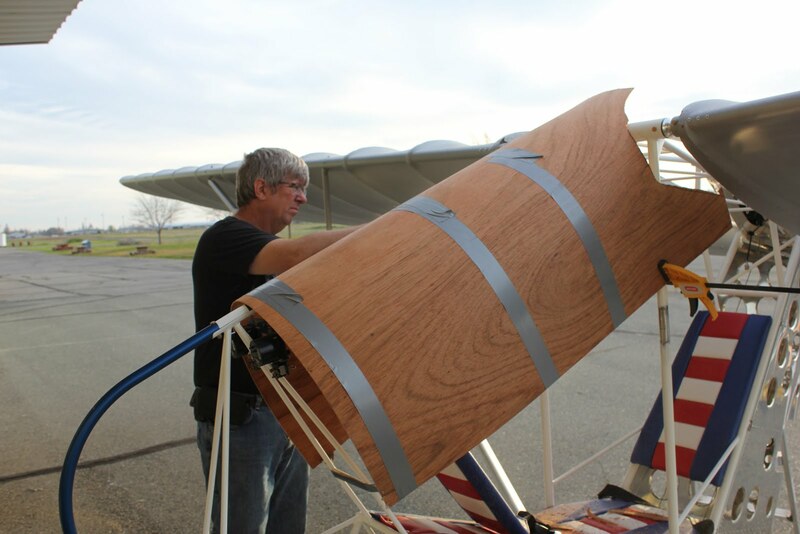 The advantage of building a fairing in this fashion is that we keep the weight very light. 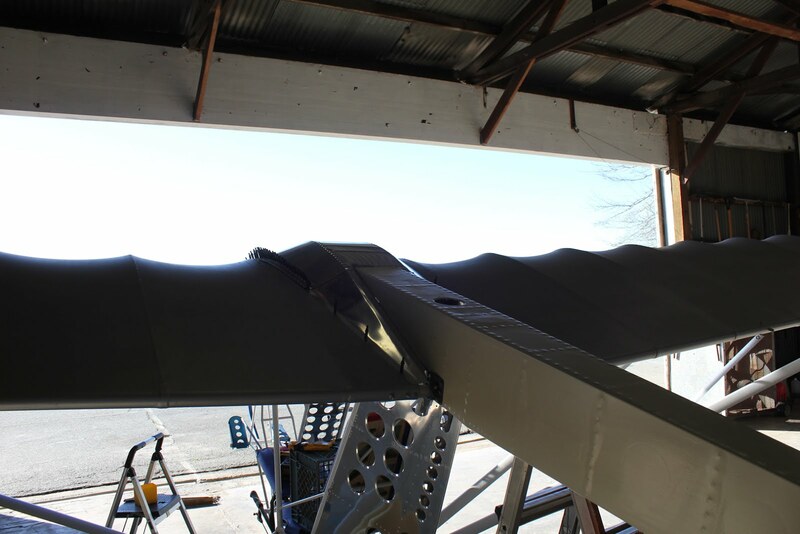 Because of the geometry the finished product is very rigid yet is allowed to flex with the structure of the wing. And the finished product installed on the aircraft. Once we get to the stage of installing the ballistic parachute there will probably be some additional modifications for the rocket exit hole. We will add that to this blog pages well when we get to that stage. 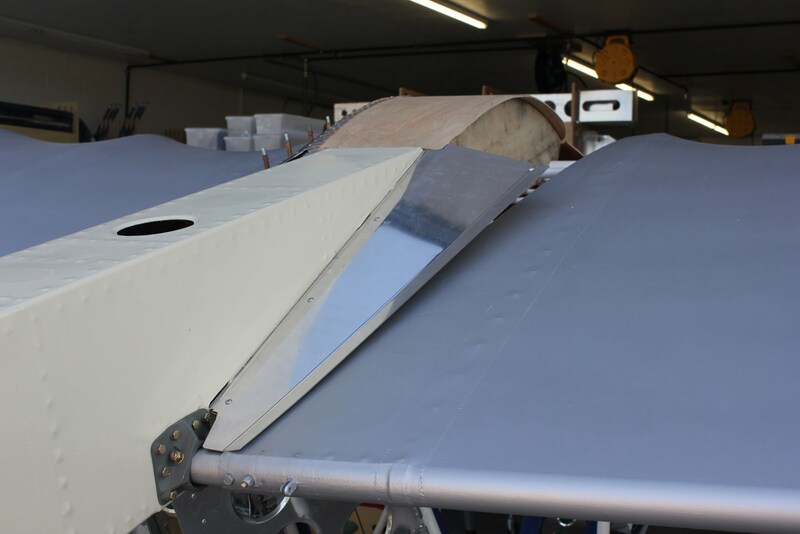 And although the total wing center section fairing wasn’t accomplished quickly the process was relatively straightforward, and the final product very functional. The next step in the process will be to install the forward windshield. 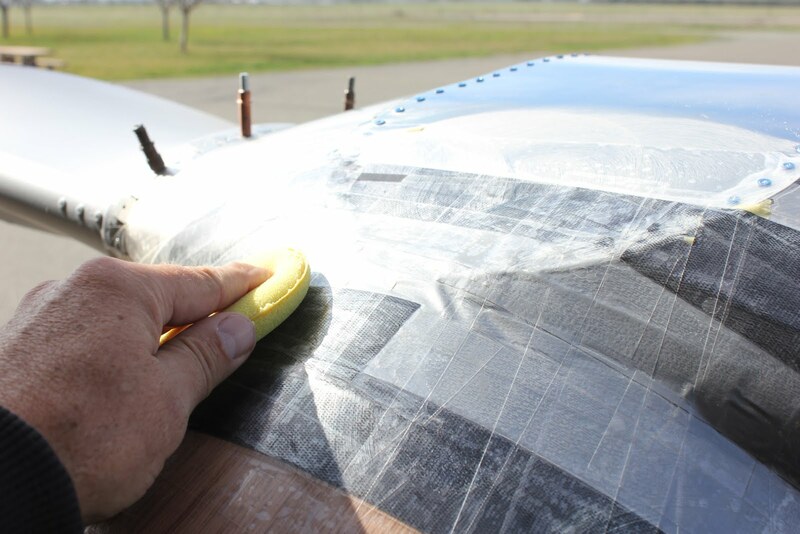 Our design will allow us to remove the center section fairing while leaving the windshield permanently installed on the aircraft. 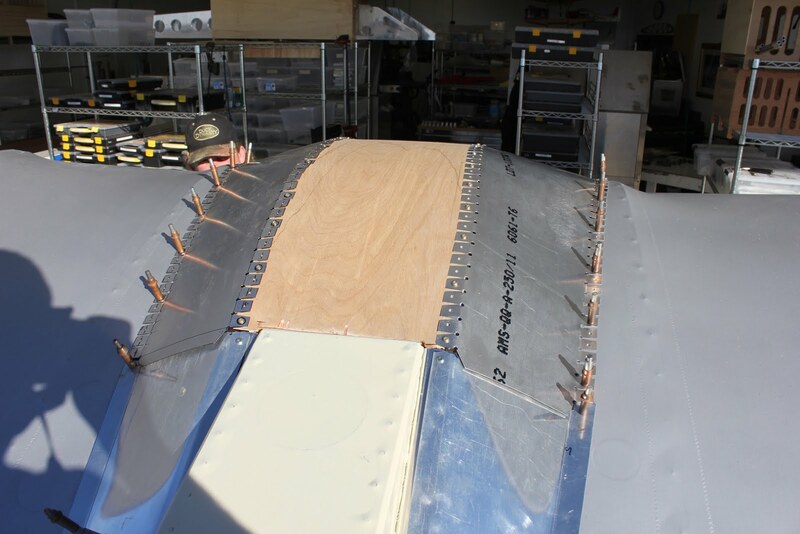 Once the plastic has been cut fit and drilled we will remove the protective coating and begin the installation process. The plastic weighs almost identical to the piece of aluminum that has been removed. 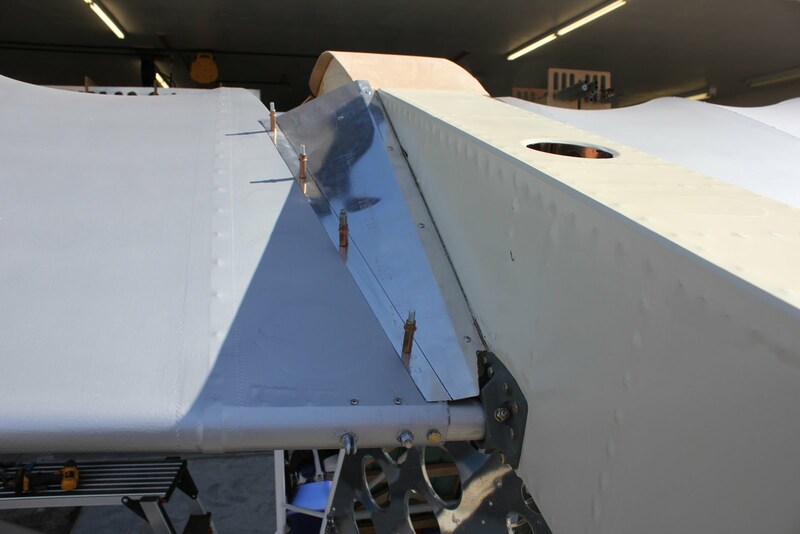 We are installing the center section replacement plastic piece as well as the original aluminum piece on the nose using #6 nylon screws and nylon acorn nuts. 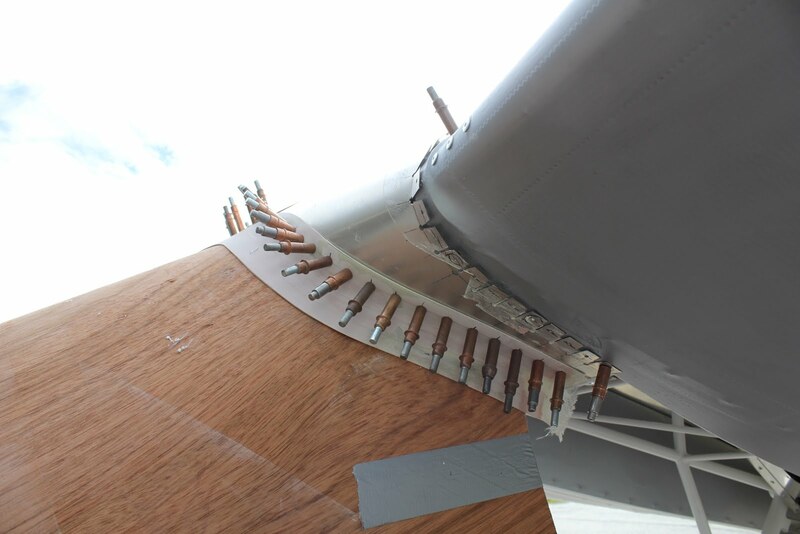 The nylon screws are designed to fail and break loose from the rest of the structure during a parachute deployment. 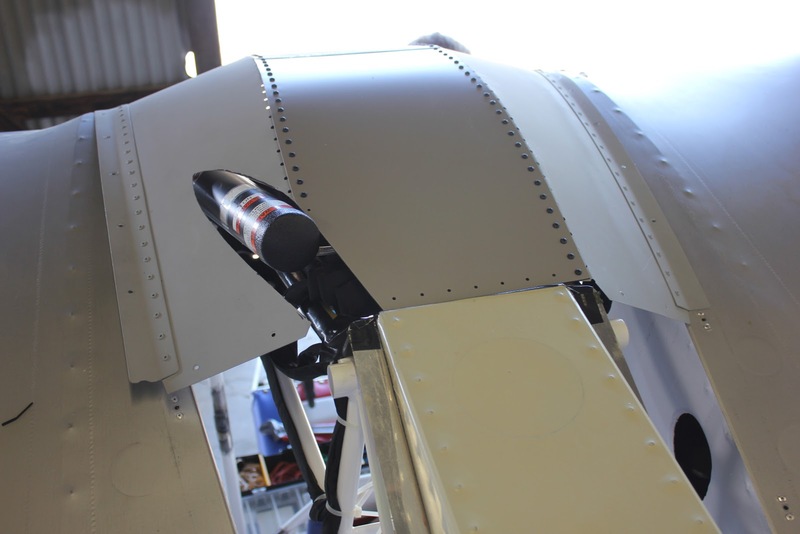 Once we have installed the fairing back onto the aircraft we can trim away the aluminum section around the rocket motor to provide clearance. 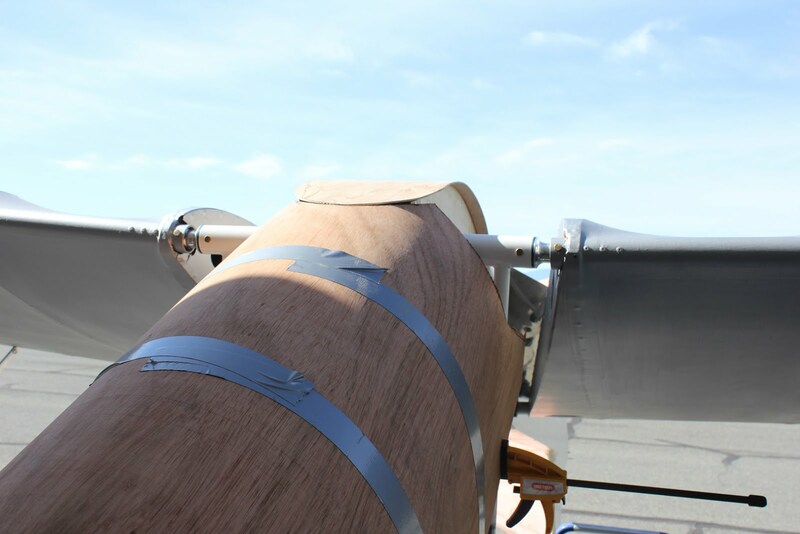 Once we have installed, removed, reinstalled, re-removed and finally got the fit around the rocket motor perfect we can go ahead and do the final installation to the wings using the # 8 screws. 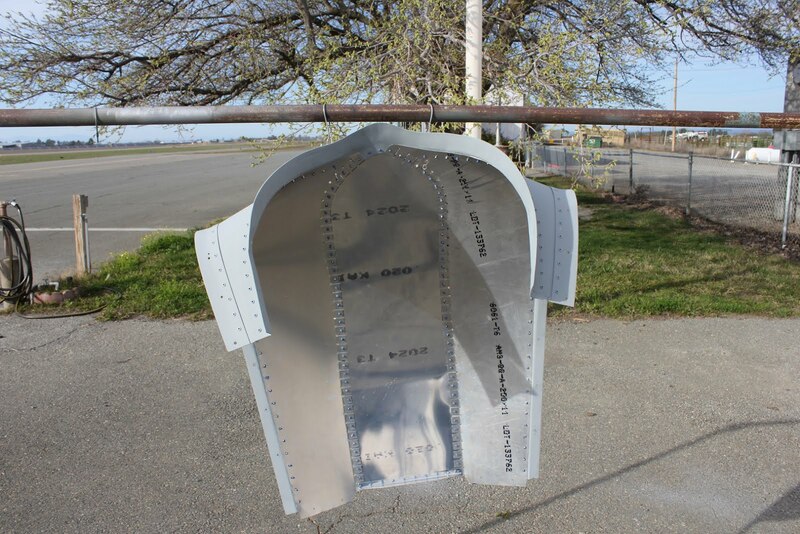 The next step is to lay out a very specific pattern and drill the plastic with a 3/16 inch drill bit on a 1/2 inch hole pattern to provide a weak area that the parachute bridle will easily breakthrough during the rocket employment. The breakaway pattern is designed for the bridle and parachute to break the center section and sides providing for a split in the center section top that the parachute may be extracted through. 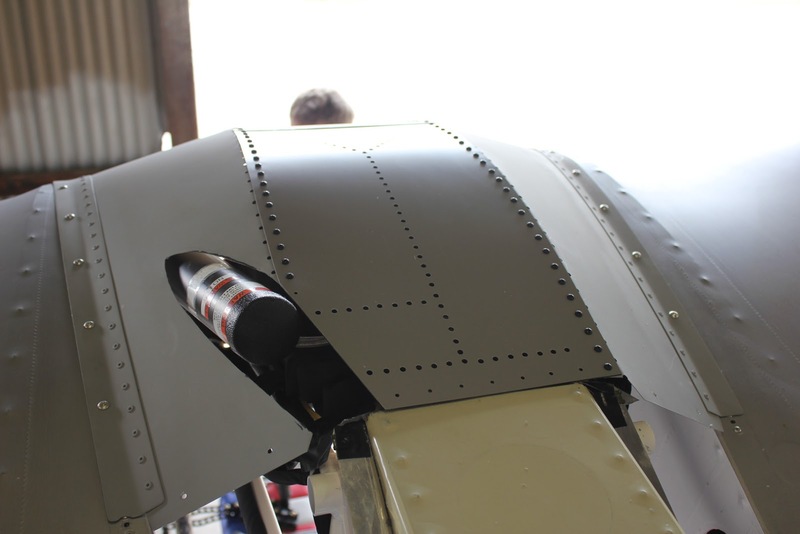 Next we reinstall the aft fairings and were now ready to start building the final fairings using the 3-D printer to enclose the rocket motor and secure the aft section of the breakaway panel to the fuselage boom.